3 and 4 Back's Wine Room and the Curat House. 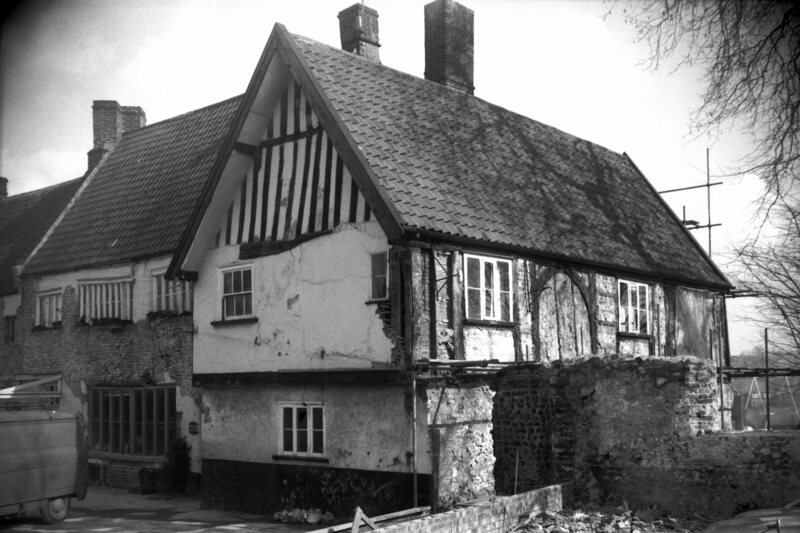 Named after John Curat, Sheriff 1529, who probably built the mansion and certainly lived there. The rooms are oak panelled. Erected 1902, architect George Skipper. 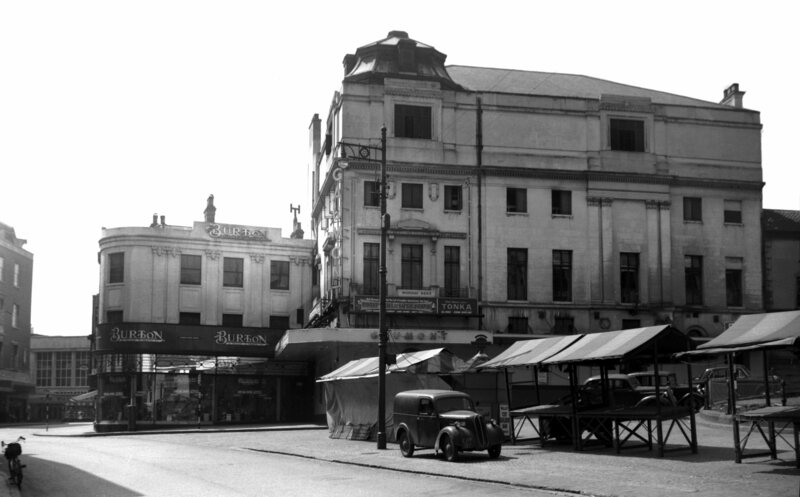 The Haymarket Picture House (latterly known as the Gaumont Cinema) opened in 1911, was enlarged in 1921 (architect J.Owen Bond) and again in 1929. 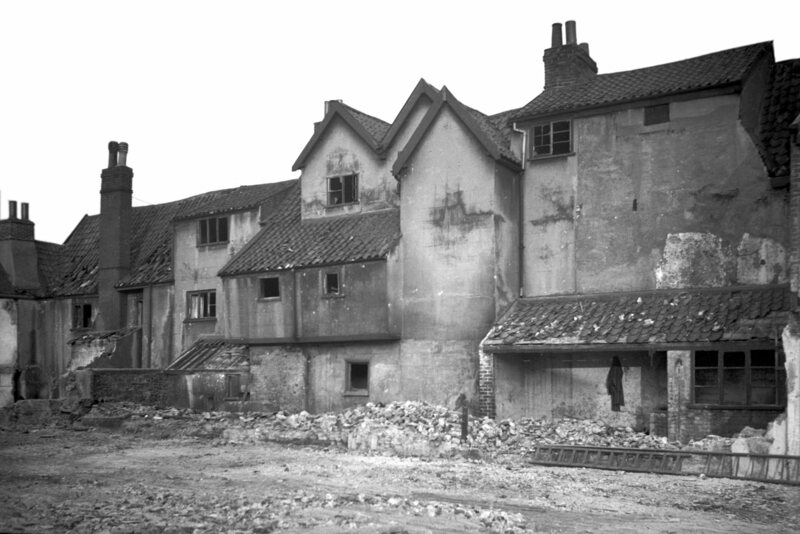 Demolished 1959. 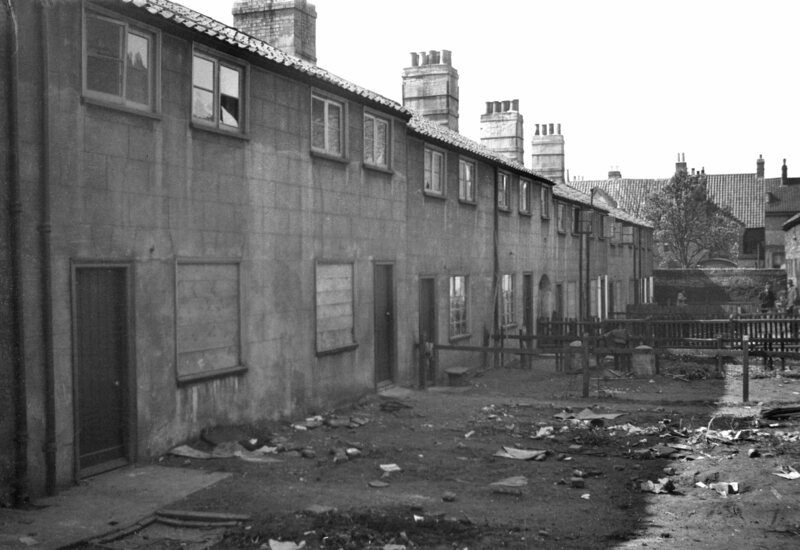 For stables at rear see William Booth St. 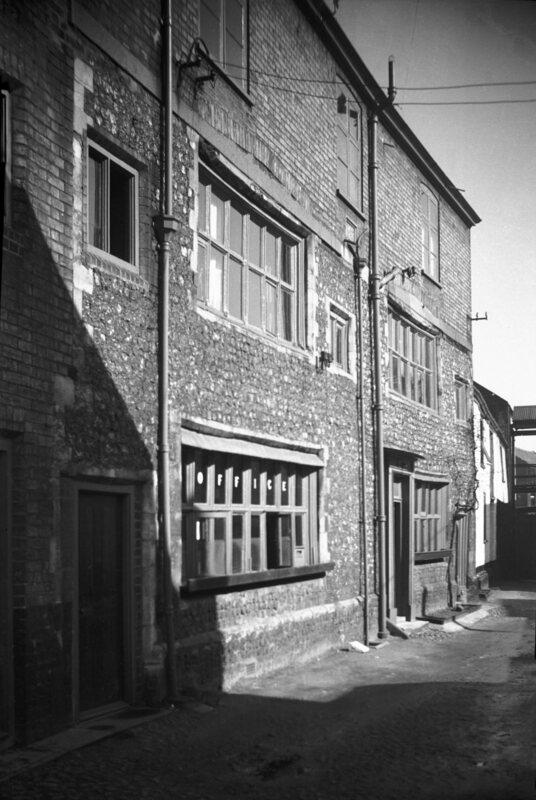 Tea and tobacco warehouse, Hay Hill, 19c. Erected in Haymarket 19th October 1905. 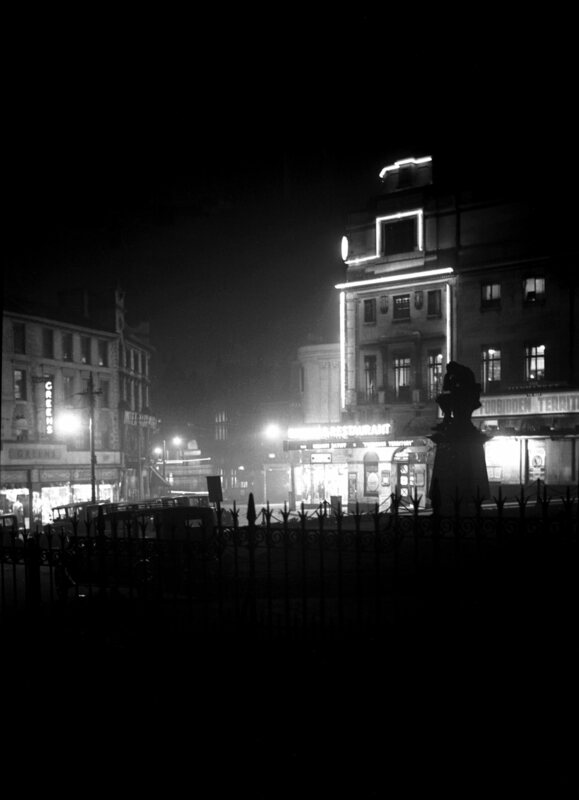 The Haymarket was described by the historian John Kirkpatrick "as being the place where the Carts and Waggons which bring Hay to the City for sale do stand, expecting buyers". 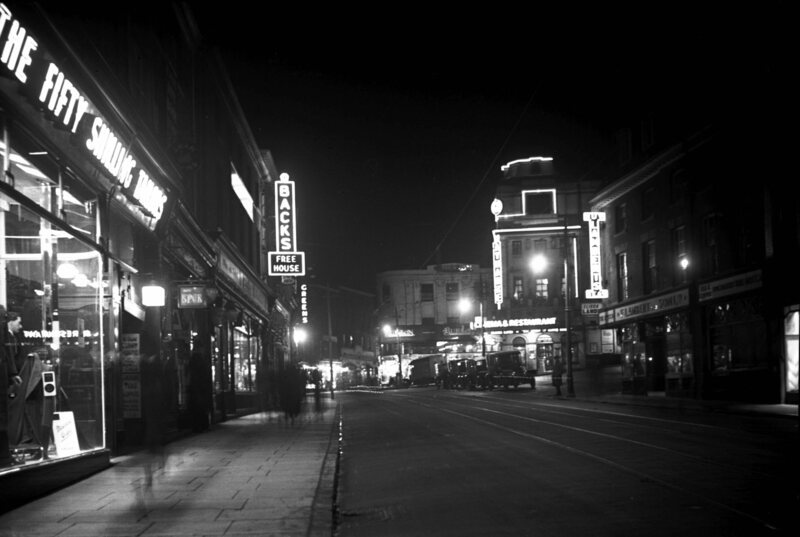 It is now many years since hay was last sold here, the name now conjuring up, for older citizens at least, happy memories of the picture house of that name. 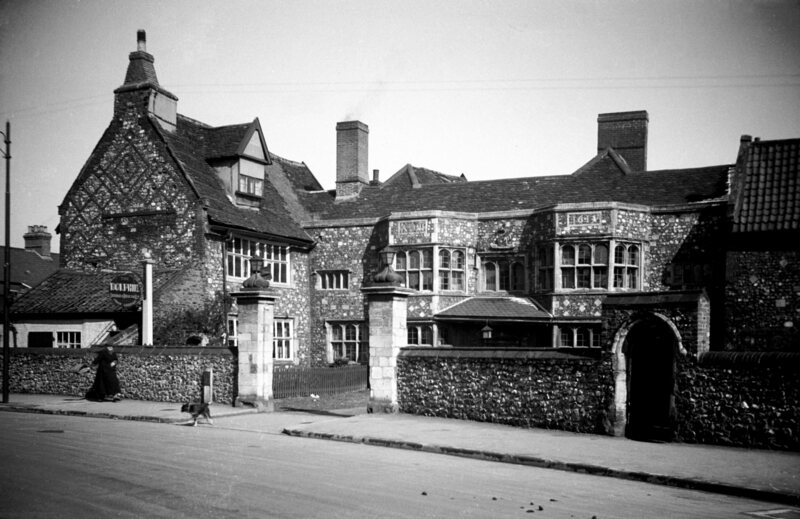 First opened in 1911, it was twice enlarged - in 1921 and 1929. 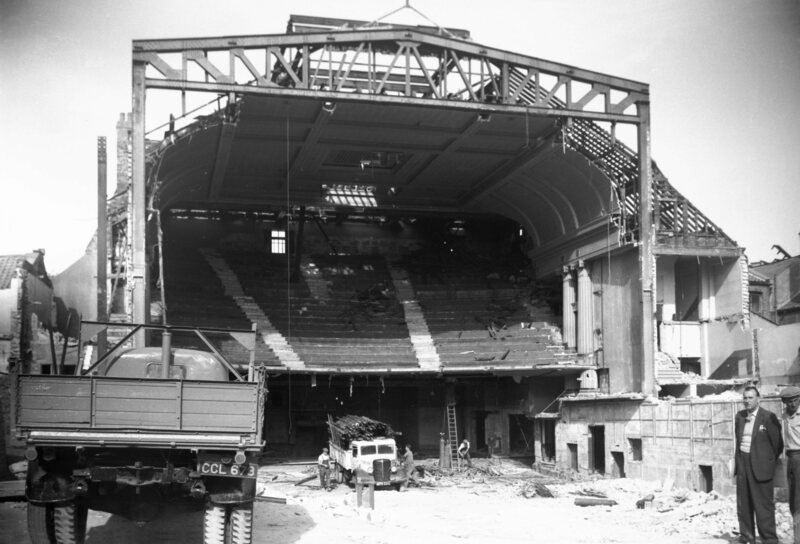 After the war, however, with the advent of television and other distractions, attendances dwindled, leading to its closure and finally to its demolition in 1959. 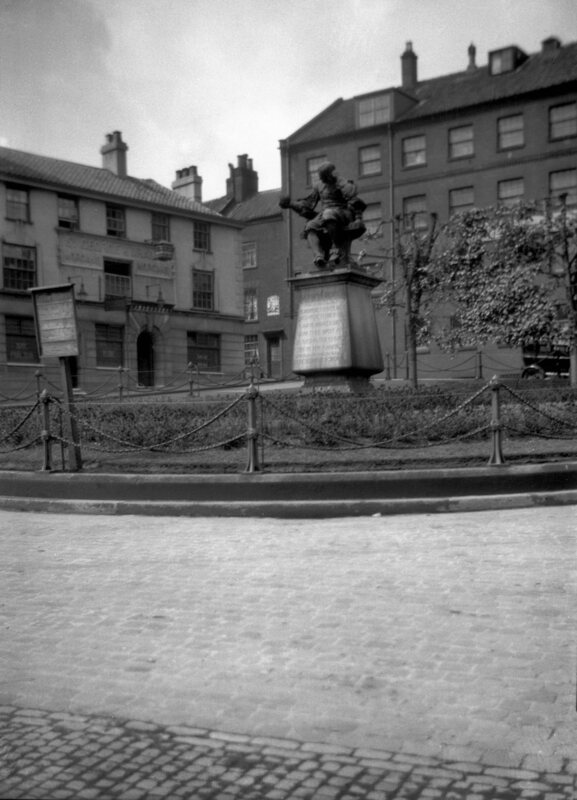 Perhaps the greatest change here in recent times took place in 1972 when the garden and lawn surrounding Sir Thomas Browne's statue were replaced by a paved concourse with seats and a "water feature". 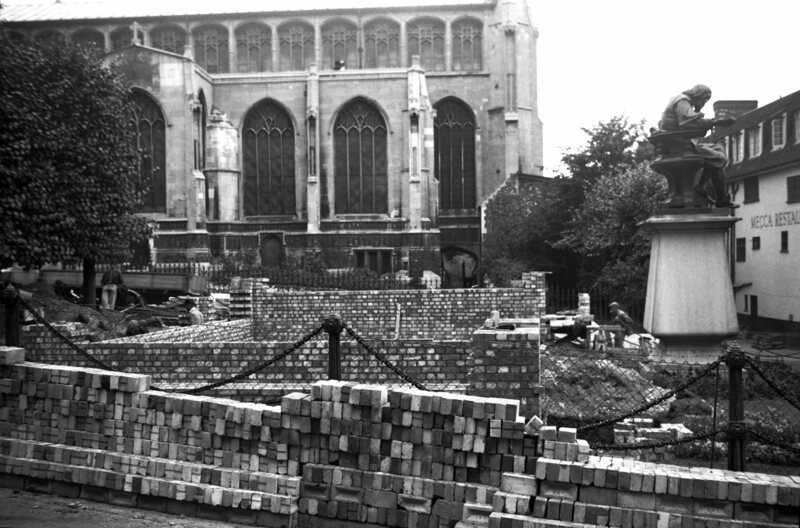 The pleached lime trees that had formed an effective screen to a 19c warehouse had earlier been cut down, other trees being planted instead on the north side flanking St Peter Mancroft churchyard. 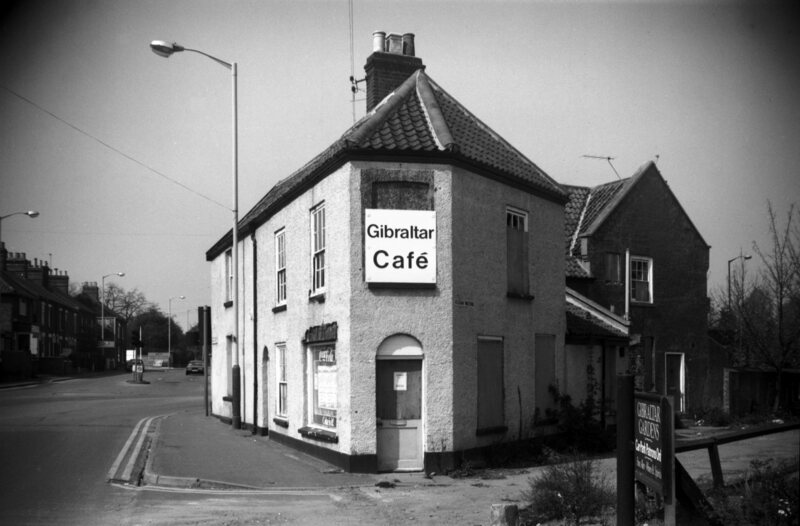 One vivid memory is recalled by this photograph. 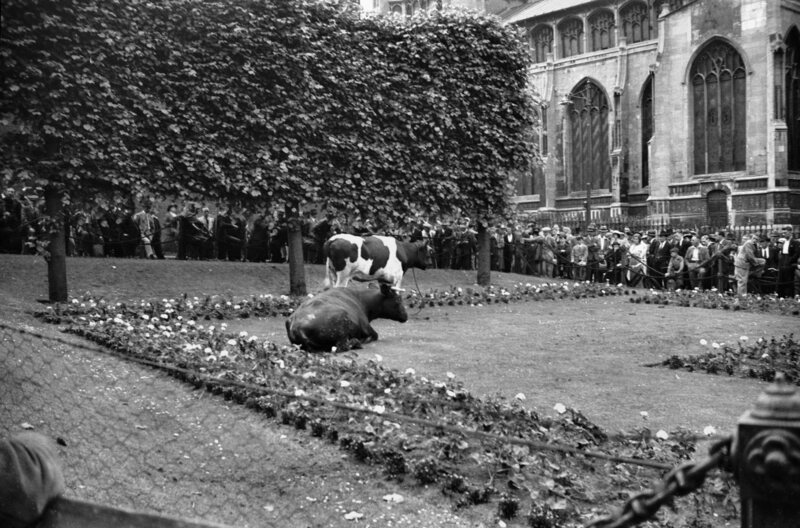 On 26th June 1937, some cattle on their way from the old cattle market stampeded from Orford Hill. 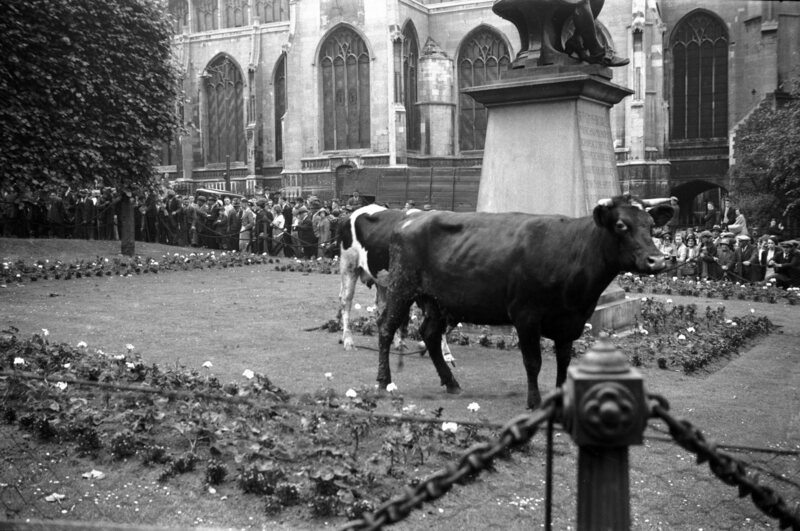 Their headlong career ended within the protective chains of the garden, but a further hour elapsed before they could be persuaded to enter the float that had been brought round for them to resume their journey. 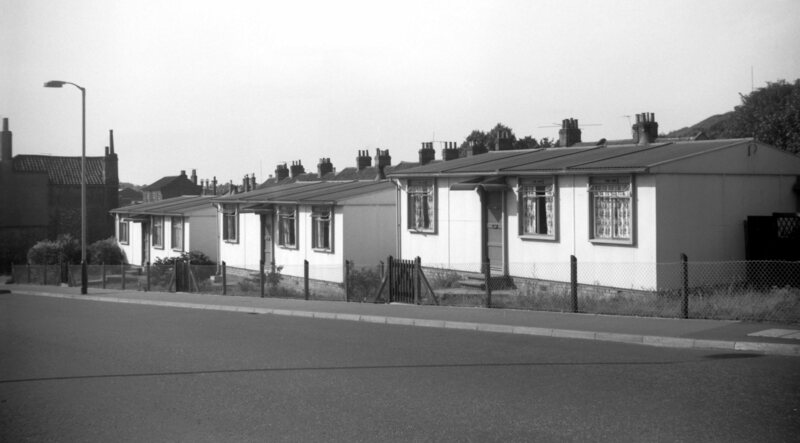 On west side of Heartsease Lane. 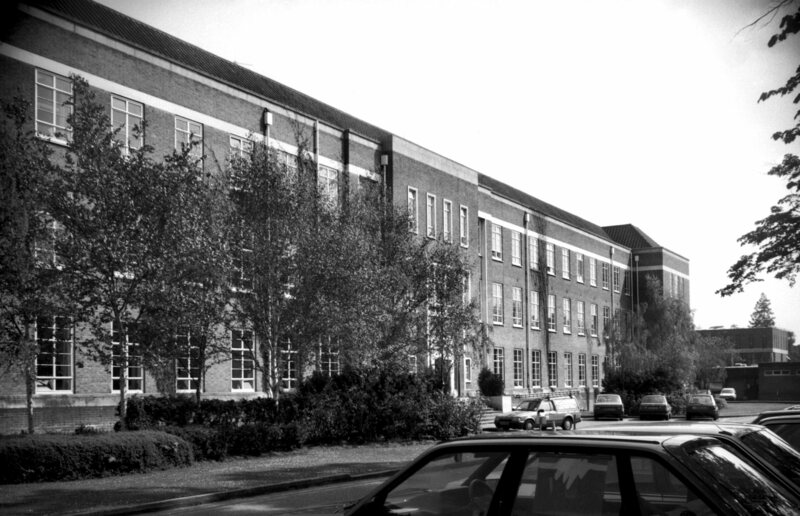 Opened 1996, architects Dennis Black Associates. 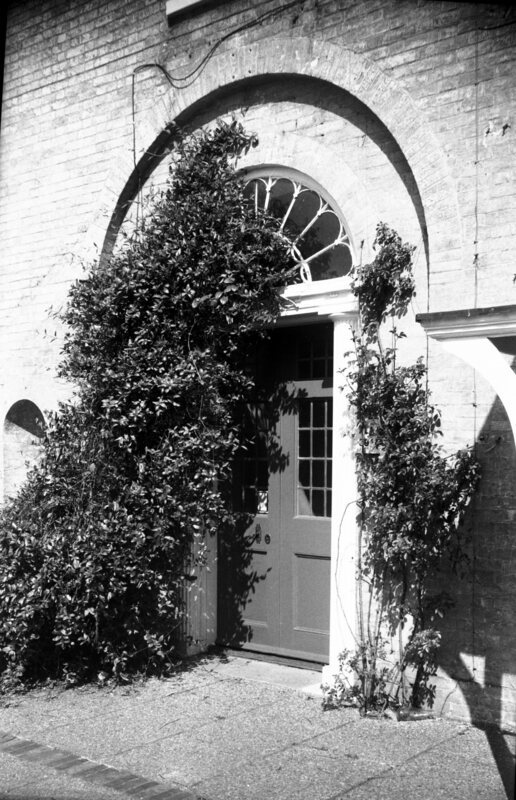 During the 19c this was the property of Joseph Gray, an upholsterer, who purchased it in 1831. 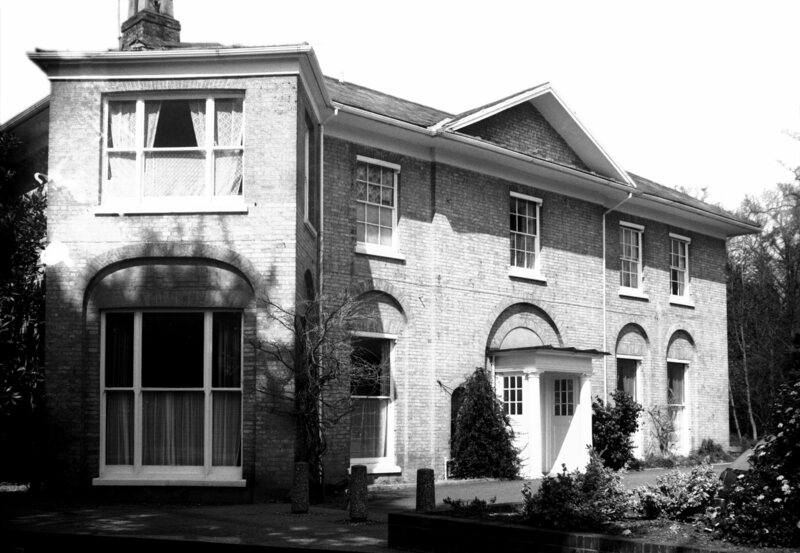 Just beyond the site of St Giles' Gate, on the south side of Earlham Rd, is Heigham Grove, a picturesque wooded slope on which stood Heigham Grove House, purchased for £3,200 in April 1925, by the City Council for conversion into the City Maternity Home. 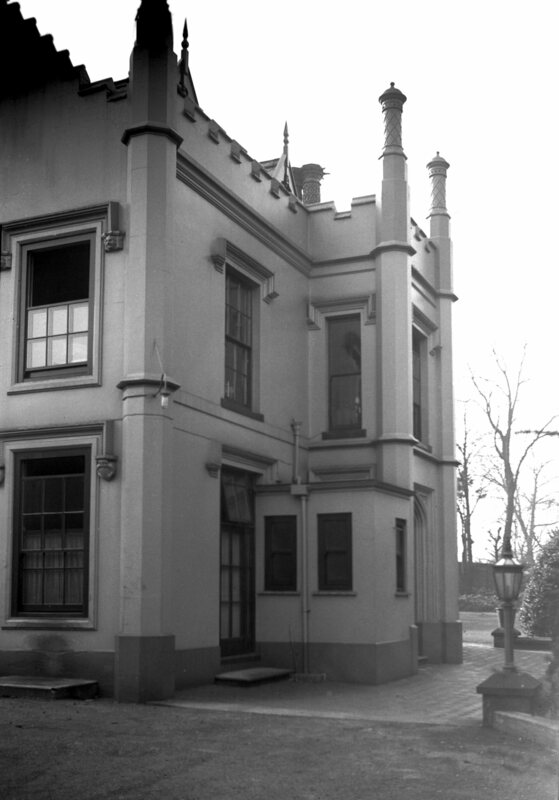 The estate was originally designed by a Mr Adams, stonemason, of Chapel Field Rd, and was an interesting example of the Gothic revival which became manifest during the early part of the 19c. 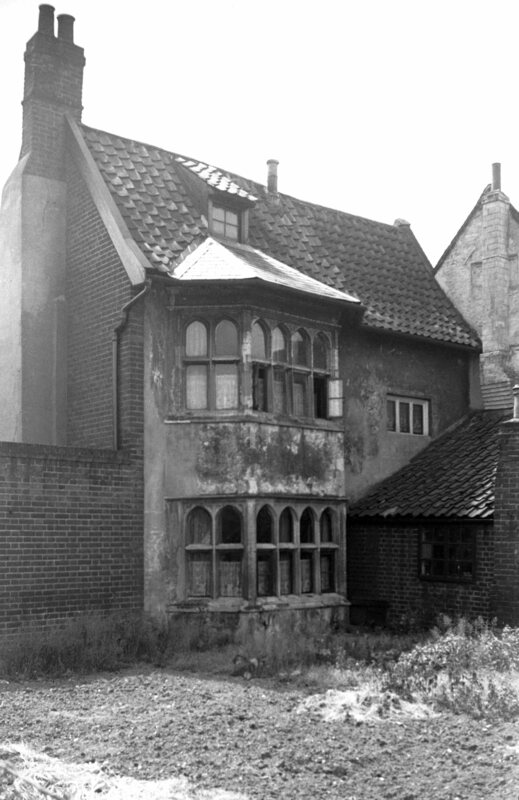 The house itself resembled an Elizabethan manor, having a projecting porch extending through both storeys, battlemented parapets, crow-stepped gables and a slim octagonal buttress at each angle terminating with a lofty round finial. 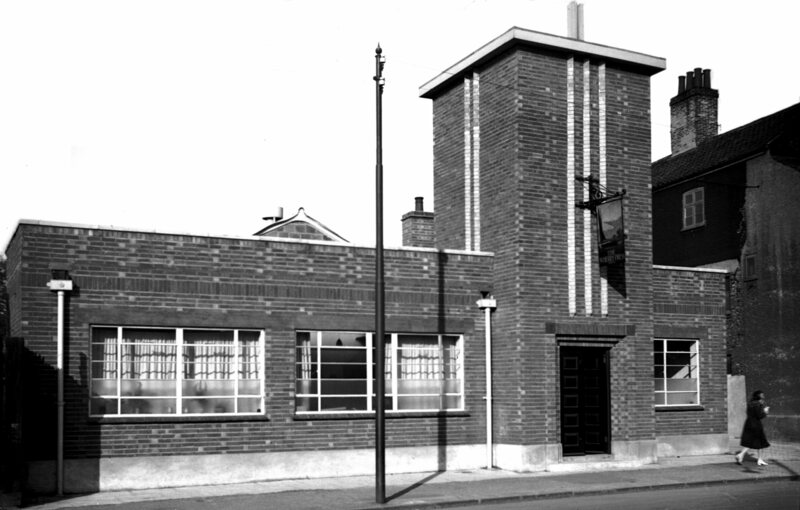 The walls were cement rendered, the finials and cylindrical chimney shafts being moulded with geometrical designs. To complete the picture, grotesque heads formed label stops on either side of certain of the windows. The grounds were also fitted up in a sham-antique style. 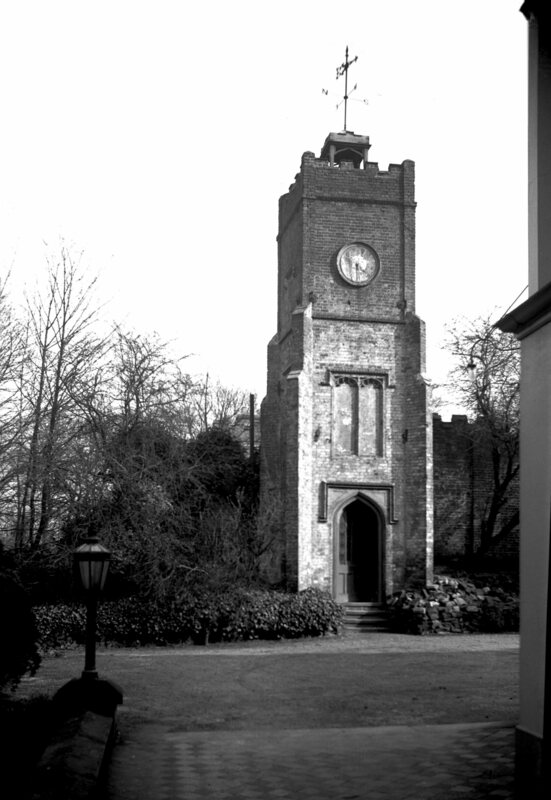 Surrounded by a lofty battlemented wall of brick, complete with massive iron gates and supporting pillars, they contained a "folly", a "ruined" Gothic arch, and at the top of the slope adjacent to the house was a square brick clock tower of three stages surmounted by a small wooden bell-cot and weathervane. It is said that at one time a series of busts of Roman emperors provided further adornment. 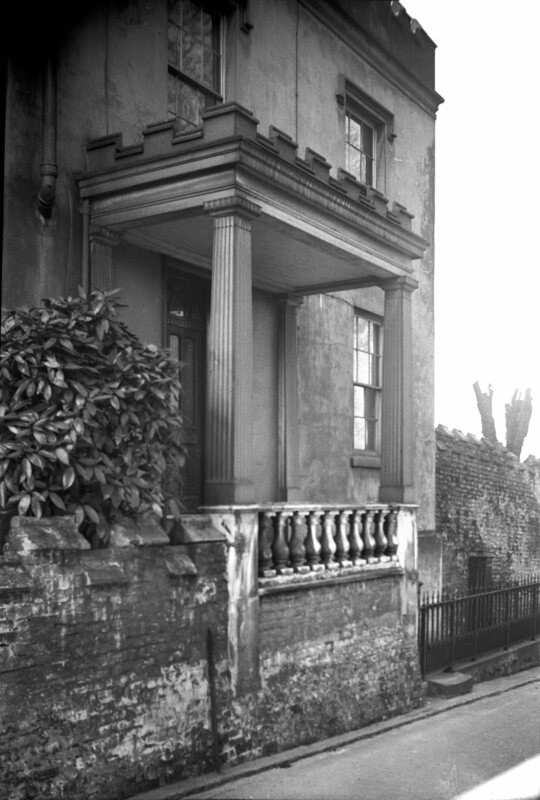 A certain brick pillar, which marked the boundary between Heigham Grove House and No 1 Heigham Grove, was the cause of some dissension between the two neighbours Joseph Gray (who had purchased No 1 in 1831 and to whom the pillar belonged) and Henry Chamberlin. 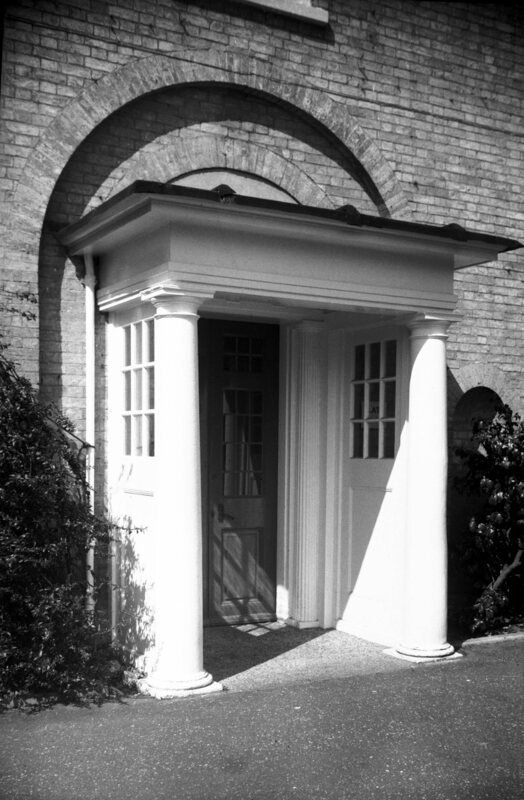 The former agreed to leave the pillar uncoloured as it "would disfigure his [Mr Chamberlin's] arch entrance to have part brick and part coloured". 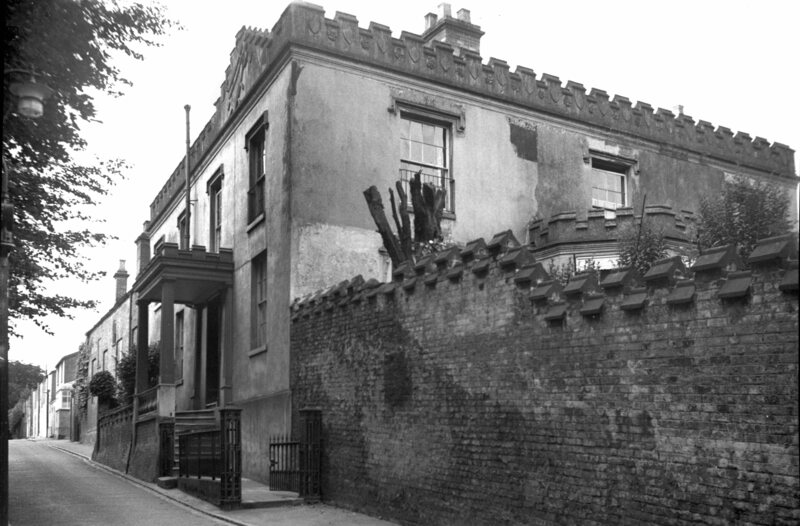 Several years later (in 1853) when Mr Charles Winter was the occupant of Heigham Grove House he coloured the pillar, thinking it to be part of his property. 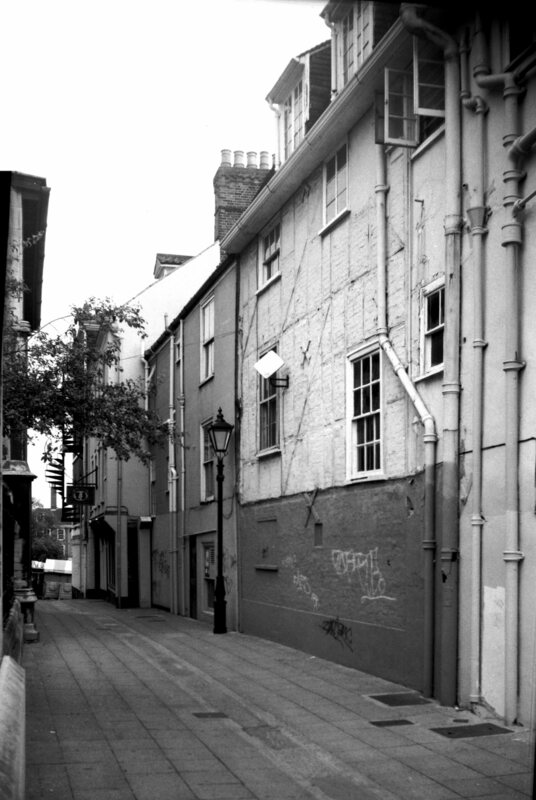 In consequence Mr Gray "with his [Mr Winter's] knowledge...placed a stone in it on the west side marked 'J.Gray 1831'. Adams, stonemason, made and fixed it". 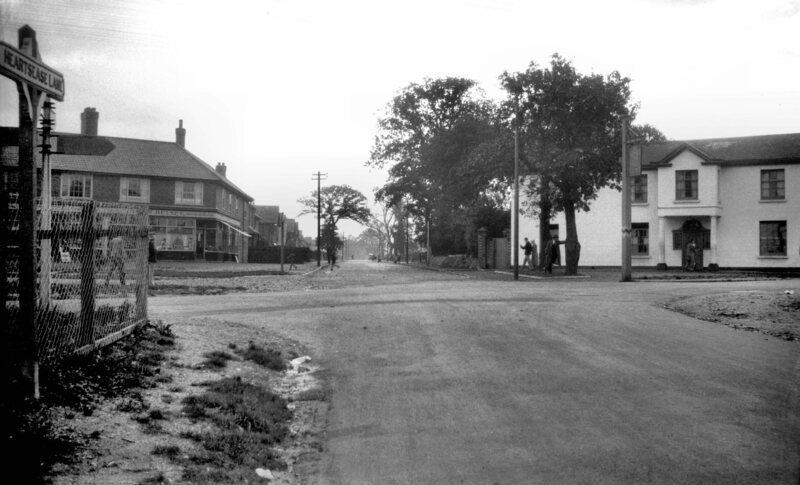 The boundary wall with its heavy iron gates was removed when Earlham Rd was widened at this point, and on 27th June 1942, Heigham Grove House itself was destroyed by enemy action; an air raid warden, Mr Thomas Bright, unfortunately lost his life. 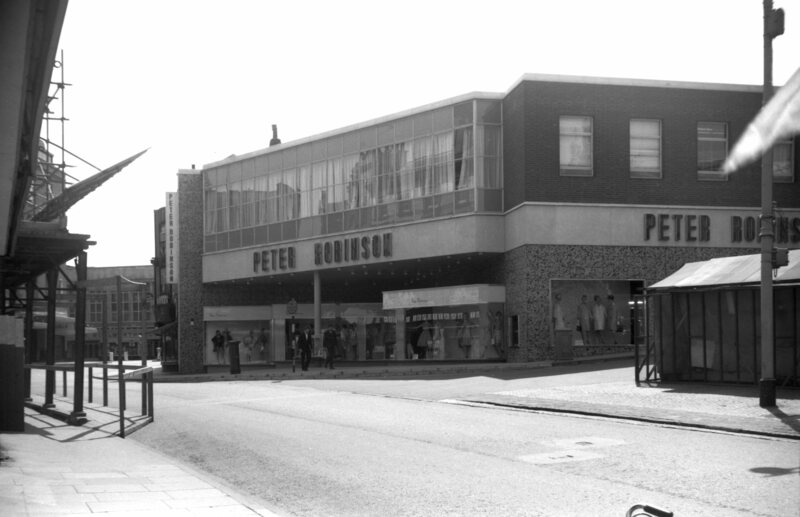 Corner of West Pottergate. 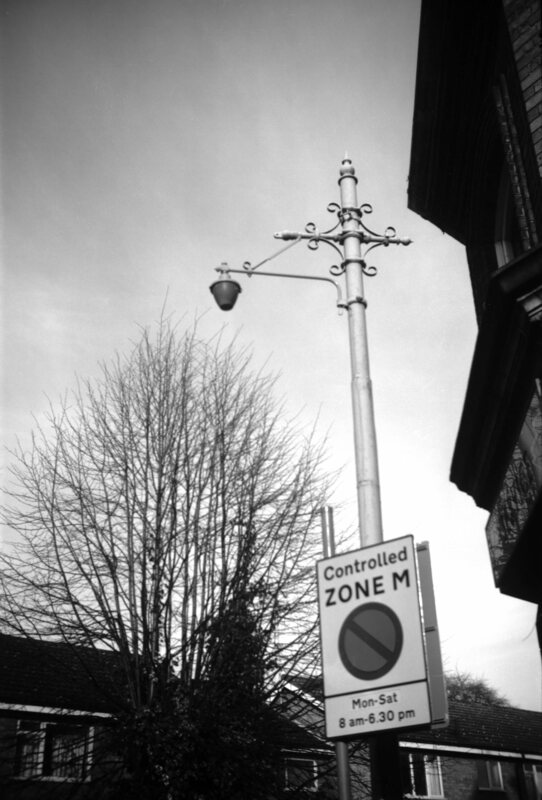 Though now supporting a street lamp, it is the sole survivor of its kind in the city. Built 1870-1 in French 14c style, architect E.Power. 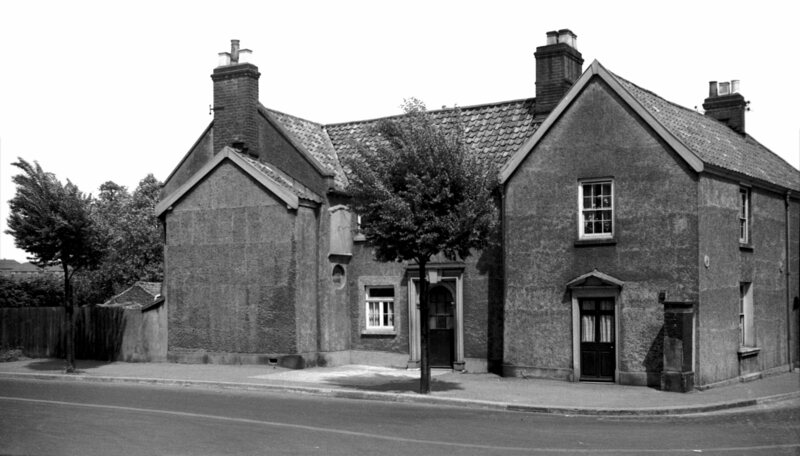 Demolished 1977. Mainly Perpendicular. 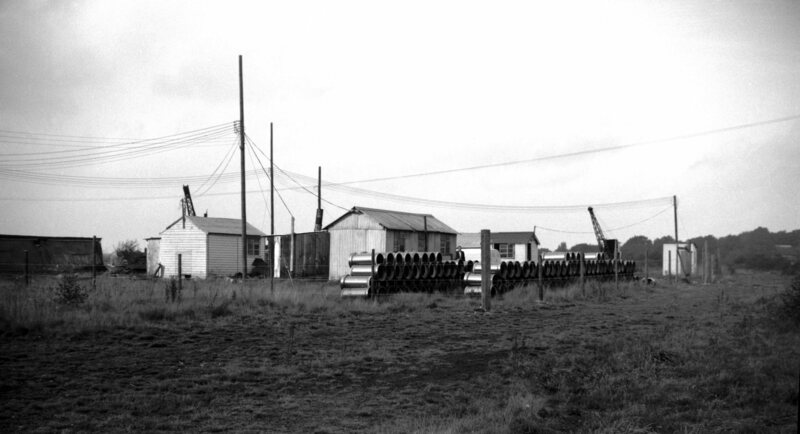 The district of Heigham, flanked by the city on the east and by Earlham on the west, grew during the 19c from a small village clustered around the church of St Bartholomew to a large residential suburb. 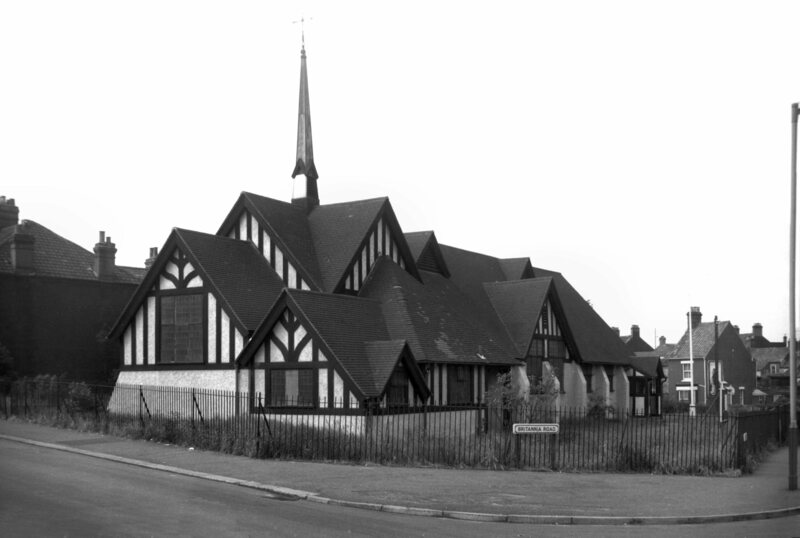 This growth led to its division into several parishes of a more manageable size, served by the new churches of St Barnabas, St Philip, St Thomas and Holy Trinity. 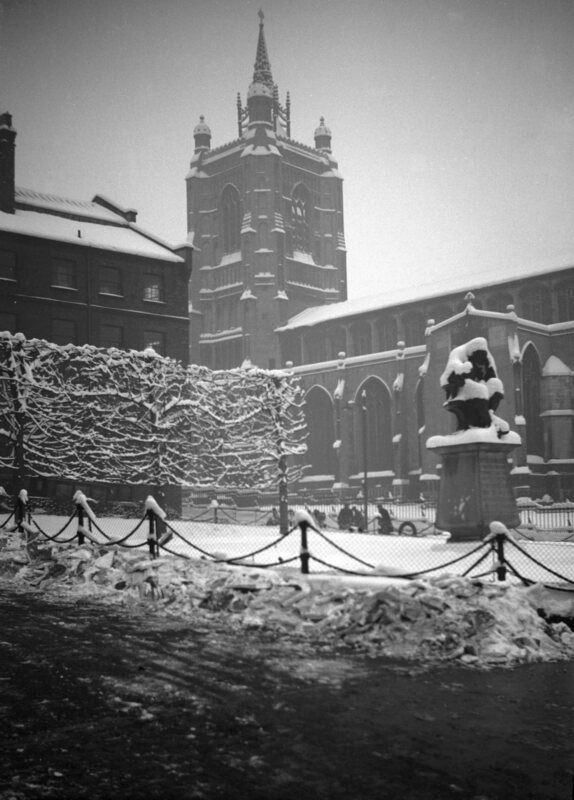 It was unfortunate that the "mother" church of St Bartholomew, with its continuous history going back over centuries, should have been the victim of an incendiary attack during the raid of 29th April 1942. 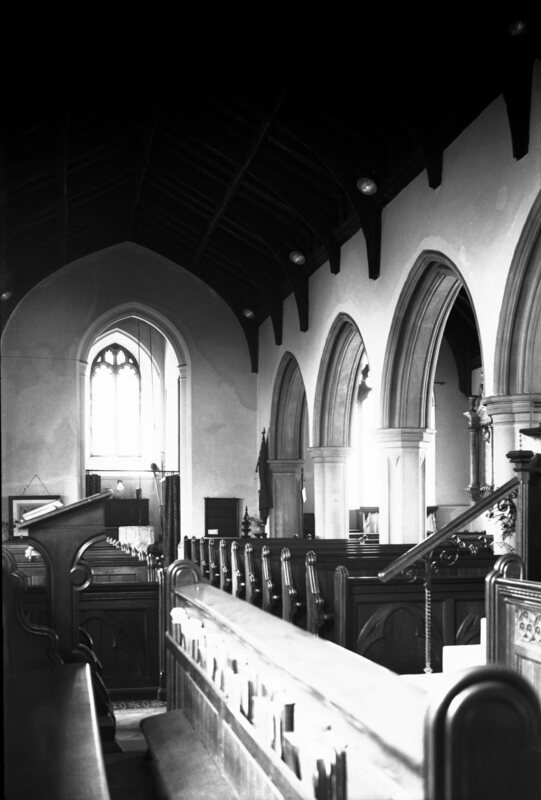 As it stood at the time of its destruction it consisted of a square embattled western tower some 44 feet high, in which were two bells; a nave, without clerestory; north and south aisles; and a chancel. 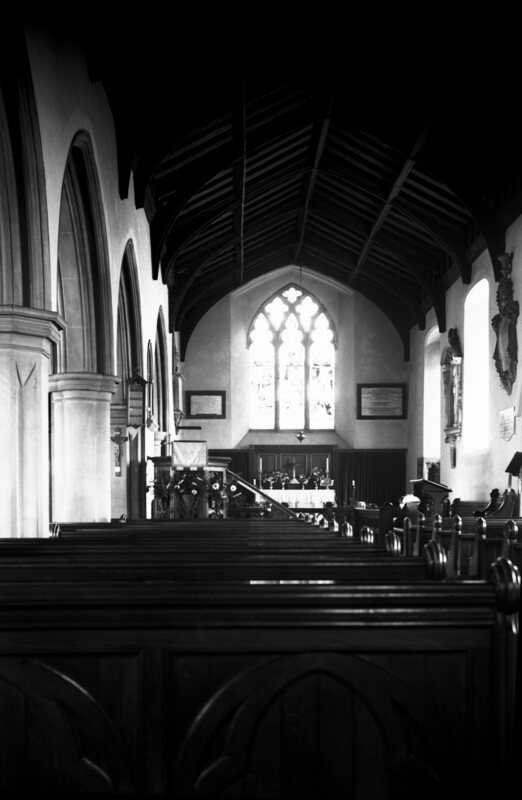 The nave and chancel were under one continuous roof, of a simple archbraced type dating from the Victorian restoration. 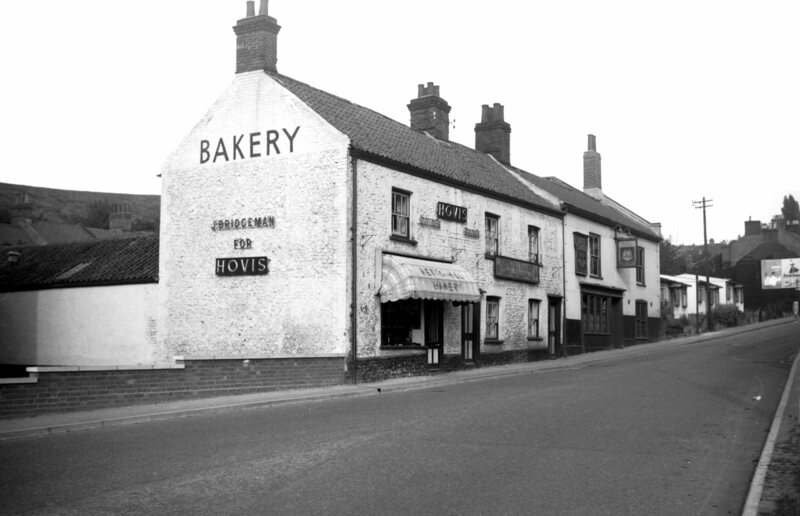 Of the aisles, the north one was built in 1878 as a memorial to Bishop Hall, who died in 1656 while residing in the nearby house now known as the Dolphin inn. 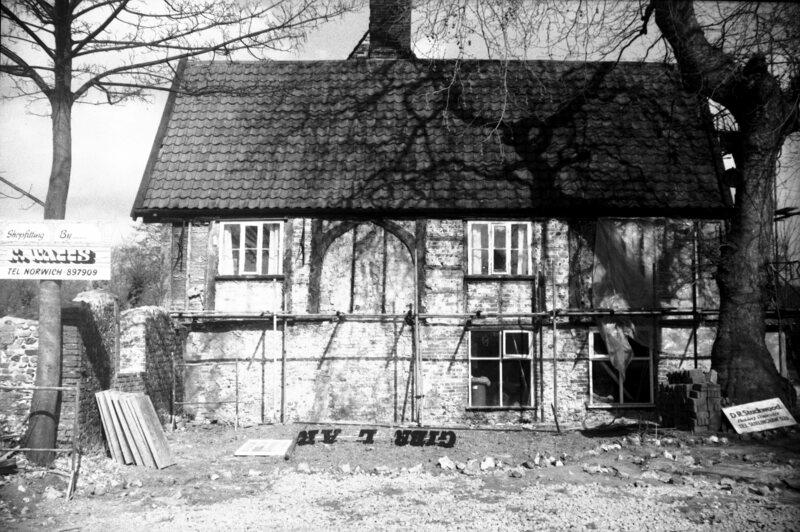 A north porch and vestry were removed when this work was carried out. 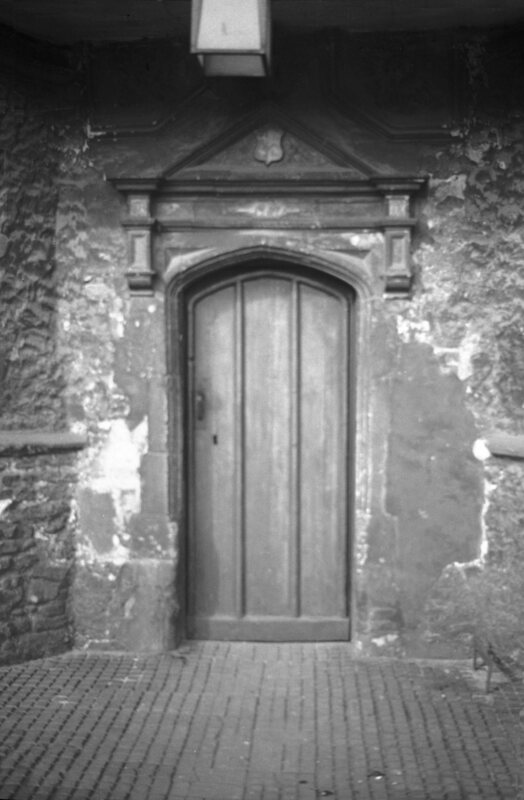 The main entrance to the church was by a doorway in the south aisle, near its western end. The sill of the easternmost window in the south wall of the chancel formed the sedilia, with an angle piscina to the left. 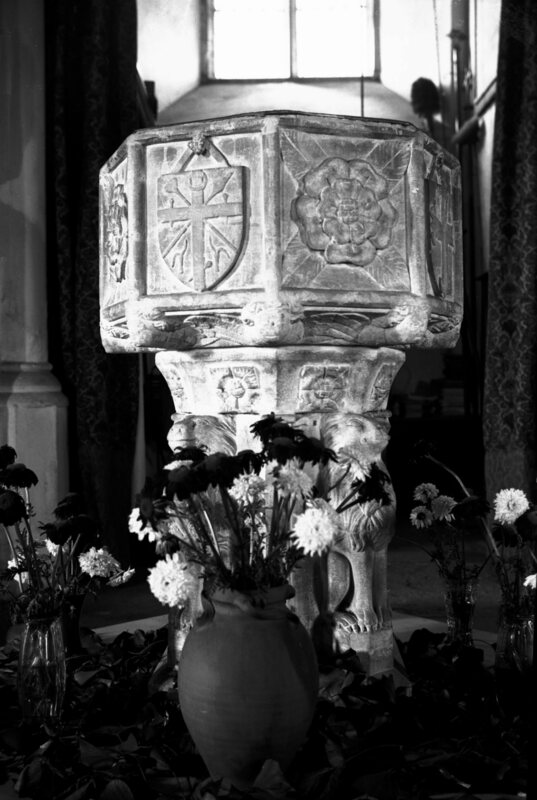 Most of the furnishings were modern, but the font, split to pieces in the raid, was of the old East Anglian type with four lions sejant around the stem. The eight panels bore the Emblem of the Trinity, Instruments of the Passion, St George's Cross, and a Cross of Moline, alternating with Tudor roses. 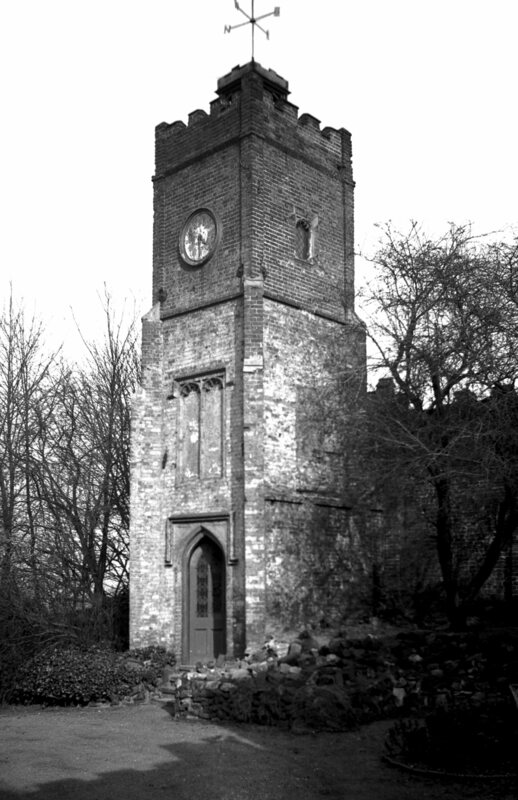 The church, including the tower, was completely burnt out in the raid; only the walls were left standing. The two bells that had hung in the tower crashed to the ground and were rendered quite useless; the treble lost its upper part, and the tenor, falling upside down, had its canons forced into the top of the bell itself. 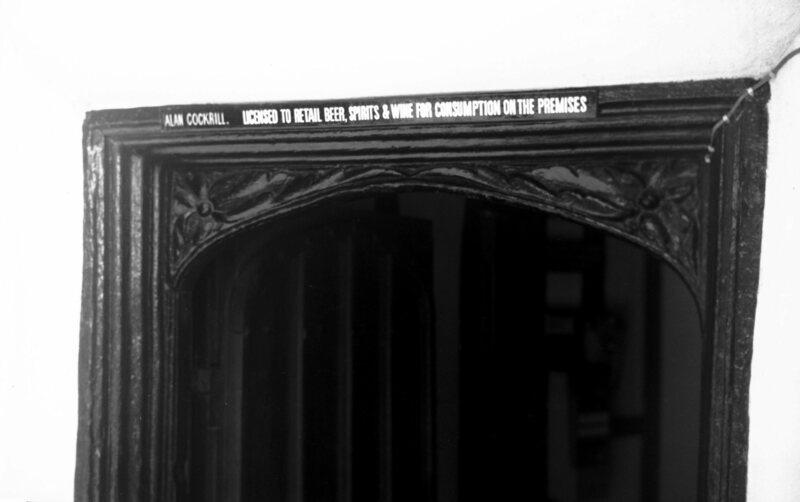 Among the monuments existing in 1942 was a tablet on the south wall of the chancel to the memory of Bishop Hall. It showed the figure of a skeleton on a black ground holding in one hand a paper on which was written "Debemus Morti, Nos Nostraque" and in its other hand a paper inscribed "Persolvit et Quietus est". At the foot was the inscription "Josephvs Hallvs olim humilis Ecclesiae Servus". 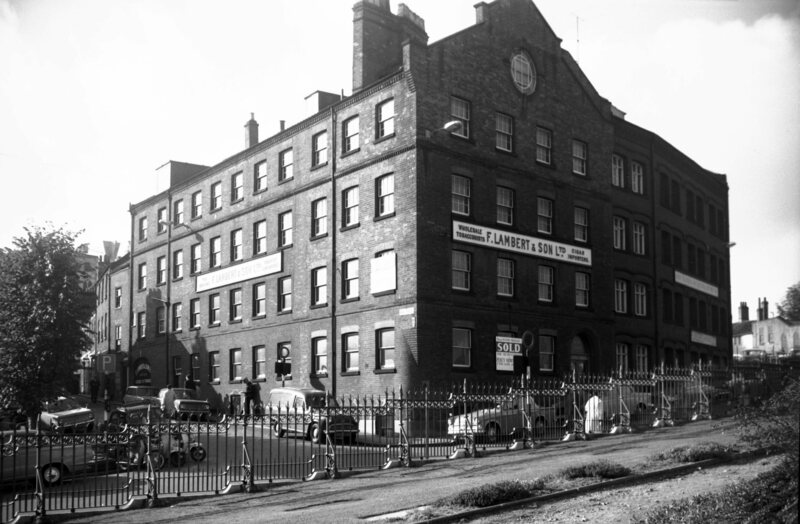 Other tablets were to the memory of the Hangar, Haylett, Parr, Robins, Seaman, Smith and Unthank families. 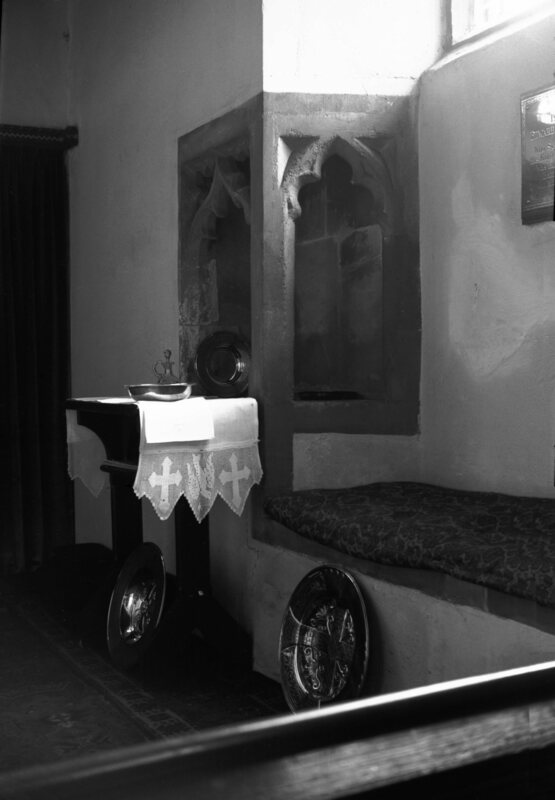 In 1949 the future of the churchyard and its ruins was under consideration by the Diocesan Advisory Committee; services were held in the meantime in the disused Nelson St Methodist Chapel. Four years later the magistrates made an order requiring all necessary action to be taken to make the ruins safe. This meant the demolition of all but the tower. Within six months the work had been done. 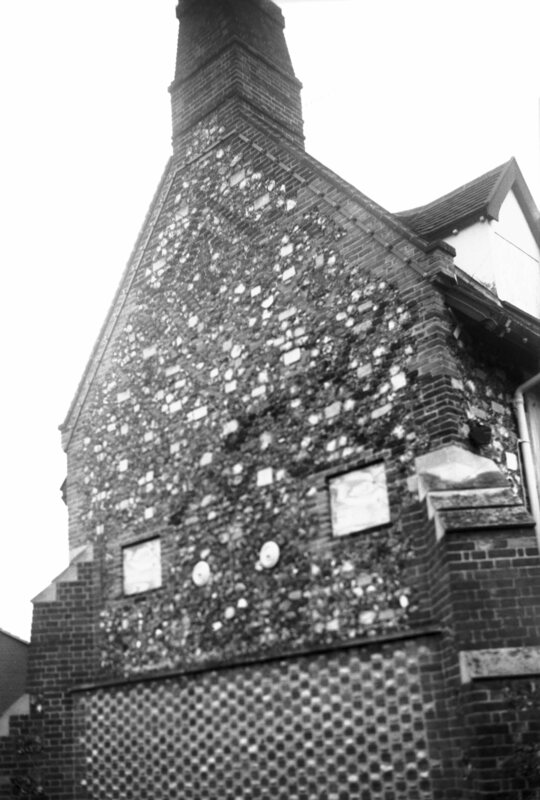 The 44 foot tall tower, which had sustained only slight exterior damage, was unusual and worthy of preservation, if only because it had no freestone quoins - a rare occurrence in East Anglia in a square flint tower. 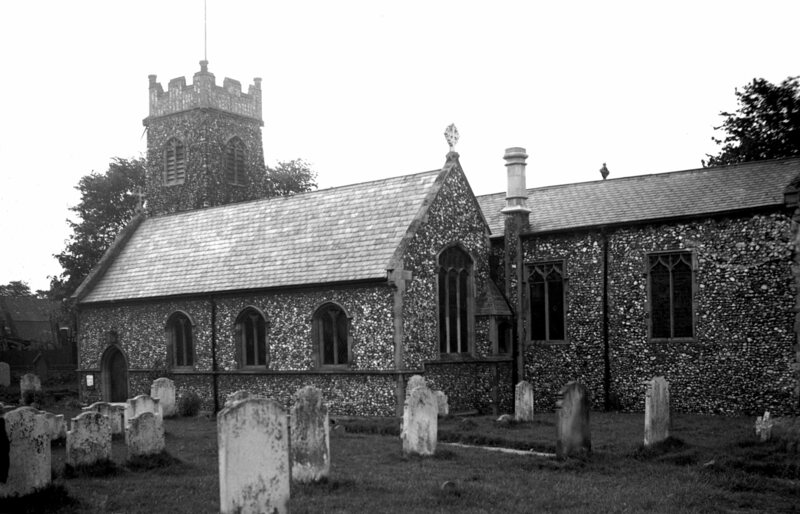 The tower of Beeston Regis church is another example, but there the corners are not so carefully constructed as at Heigham, though larger flints were used. 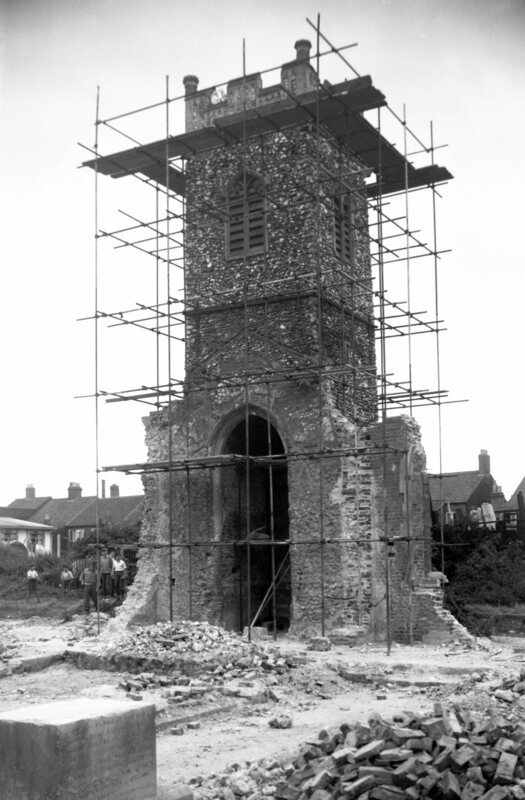 Repairs to the tower were authorised in January 1976, and six months later the City Council prepared plans to make the churchyard into a public open space. 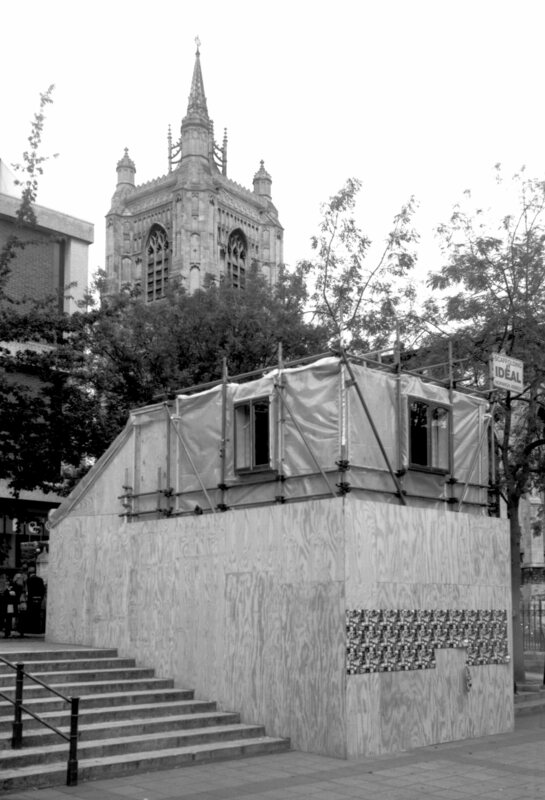 No doubt this had already been foreseen, as on 21st May of the previous year the remains of Bishop Hall had been exhumed from the site of the chancel, and taken to be re-interred in the cloister garth of Norwich Cathedral. 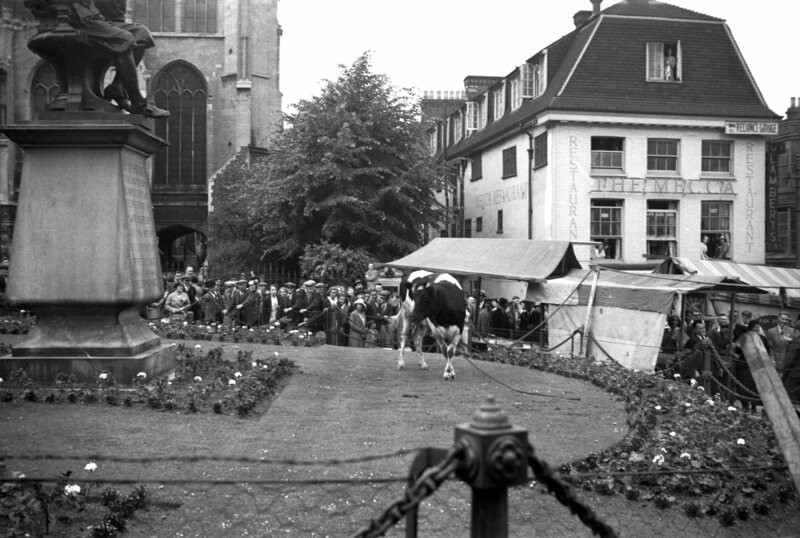 The late Tudor age saw the beginning of a movement of the populace outside the confines of the city walls. There were two reasons for this: in the first place the walls were no longer used or required for military purposes, and secondly the area they bounded was already pretty fully occupied. 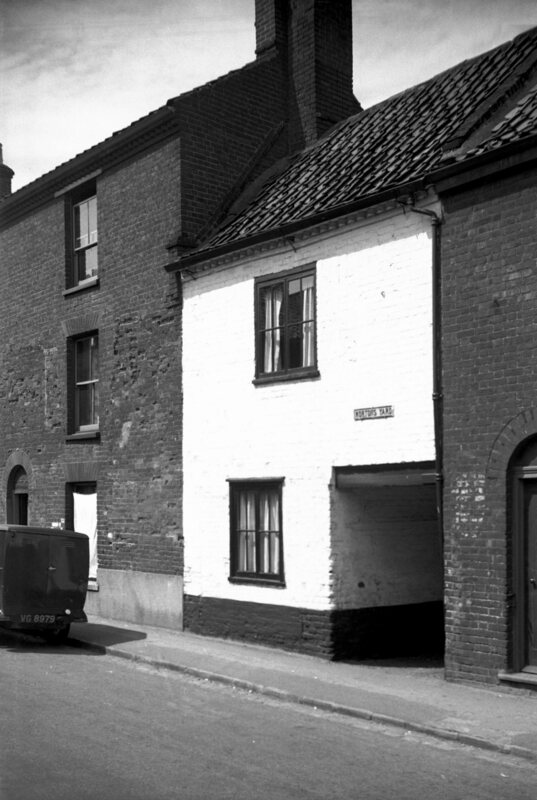 One of these early extra-mural properties was No 12 Heigham St. Much altered as it was during the course of succeeding centuries, it retained to the last a fine flint wall with freestone quoins, pierced on two floors with long ranges of windows, typically Elizabethan in character and not unlike a manor house of the period. 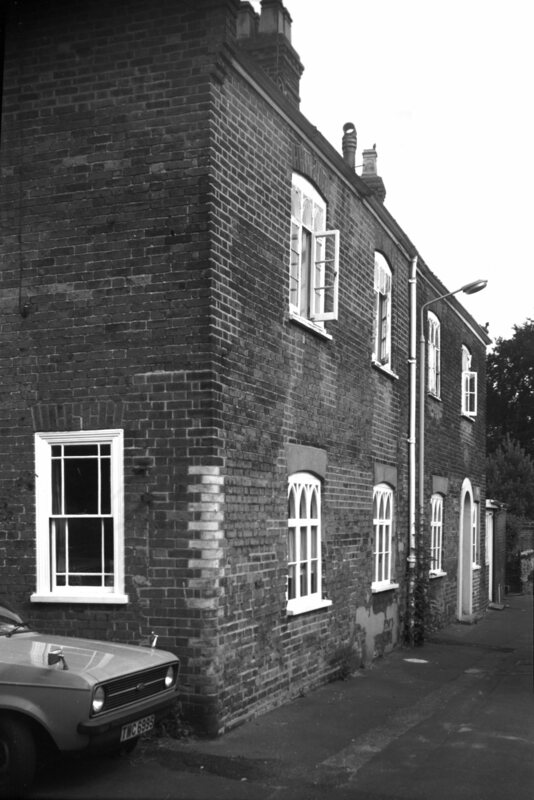 The third storey, which was of grey brick, was no doubt a 19c addition. 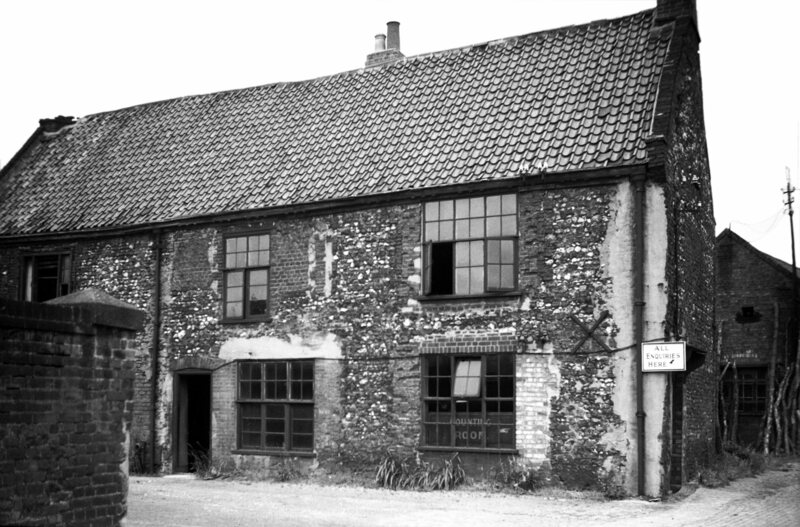 Another house of mediaeval origin and built outside the city proper was No 26 Heigham St. 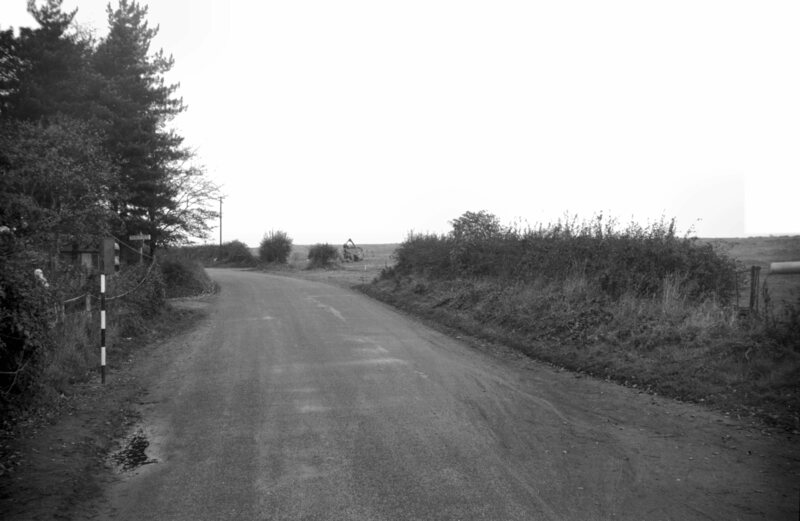 Here, however, the walls were of a rubble-like quality by no means displaying such a fine finish as the eastern front of its neighbour, No 12. 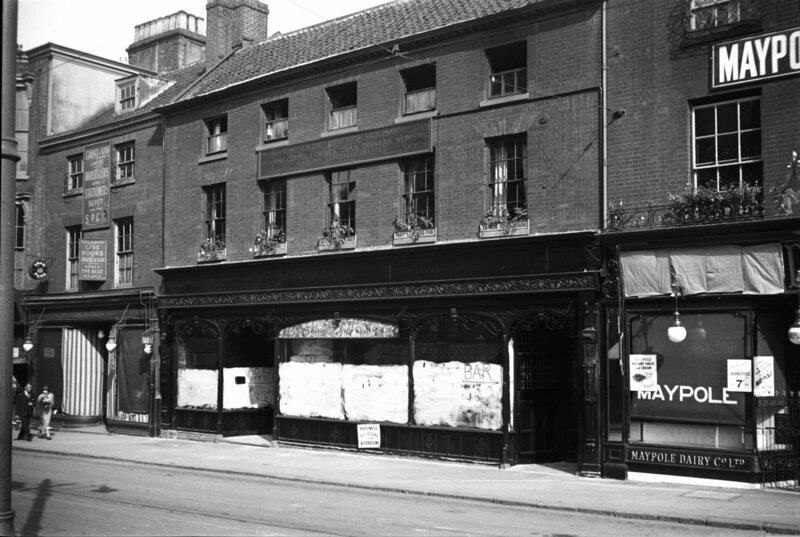 During the 19c this building was licensed as the Orchard tavern, a business that was transferred to a new building fronting the street in later years. 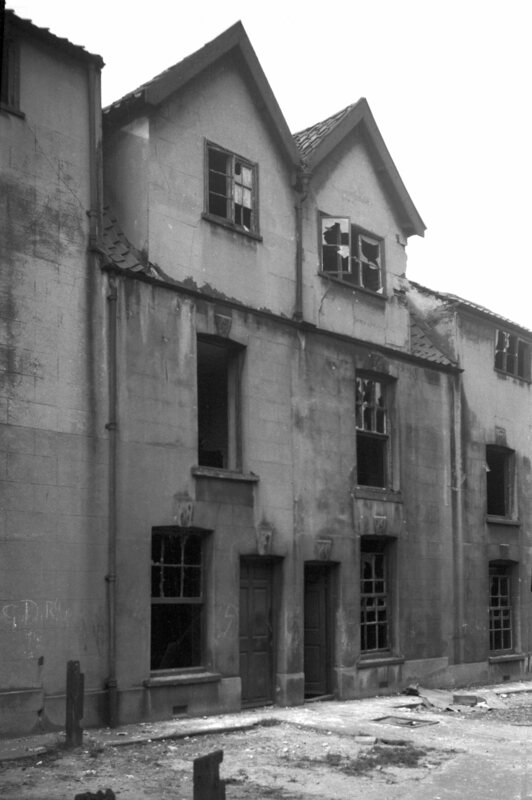 Both buildings were gutted in the April raids, as was also No 12. No previous bridge occupied the site but it superseded and ancient ferry. 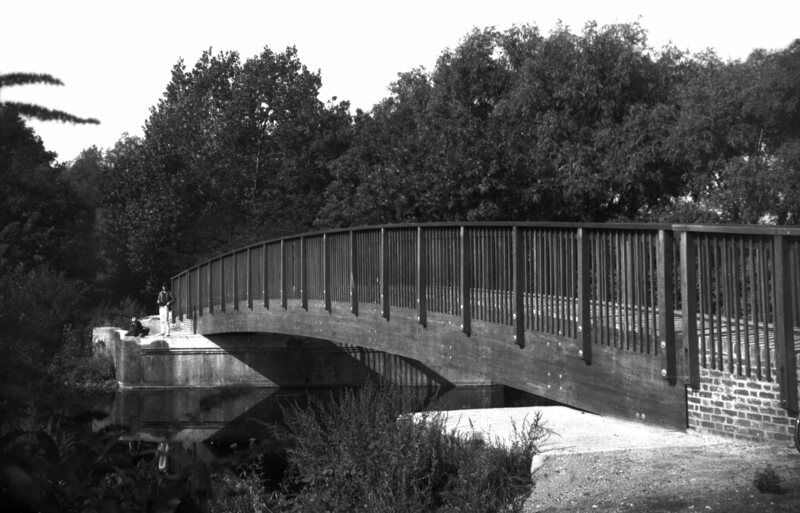 Built as a result of strong agitation amongst the people of the district, the City Engineer pointed out that because of bad approach gradients at the northern end, the site of the present Mile Cross Rd was a much better one for a vehicular bridge. 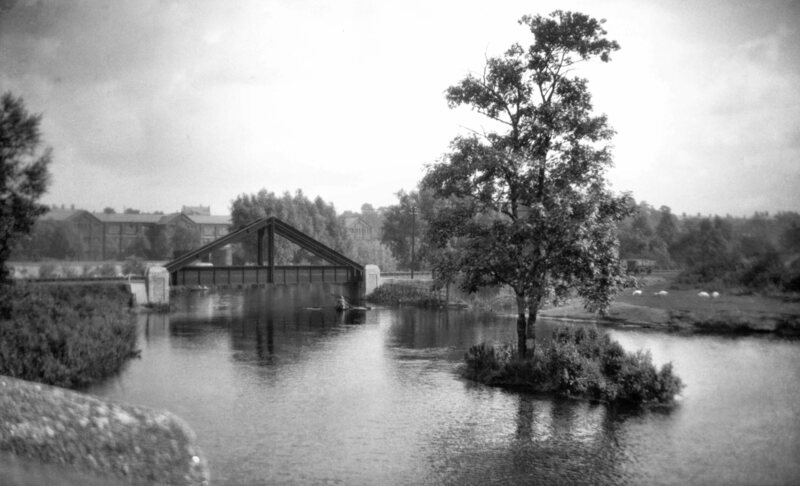 Consequently it is a footbridge only and was opened by the Mayor, Ernest Egbert Blyth MA LL.D on 15th December 1909. 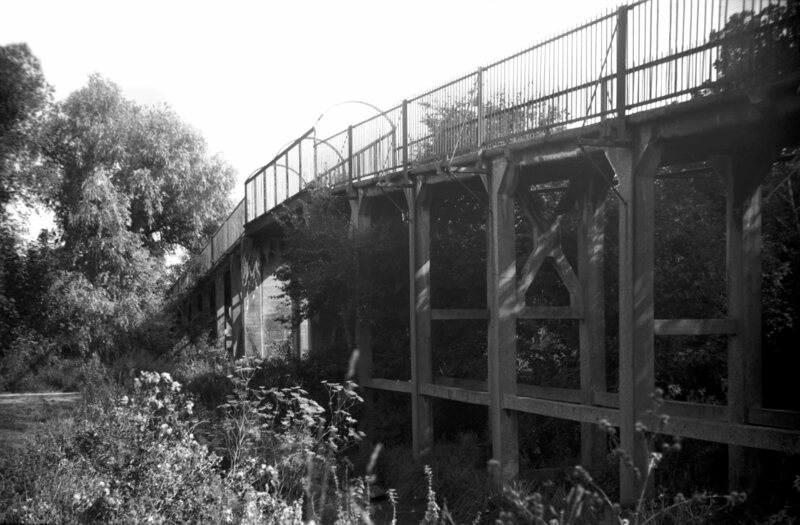 The walkway is only 6 feet wide and beyond the river bridge (which has a double span of some 75 feet) is carried upward on reinforced concrete supports to another bridge spanning the site of the M and GN Railway line. 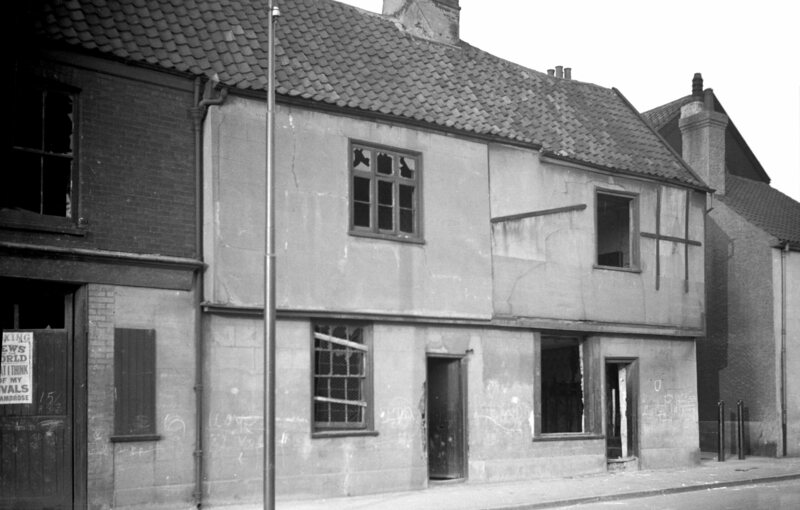 This has been described as an early Norwich example of the use of this material. 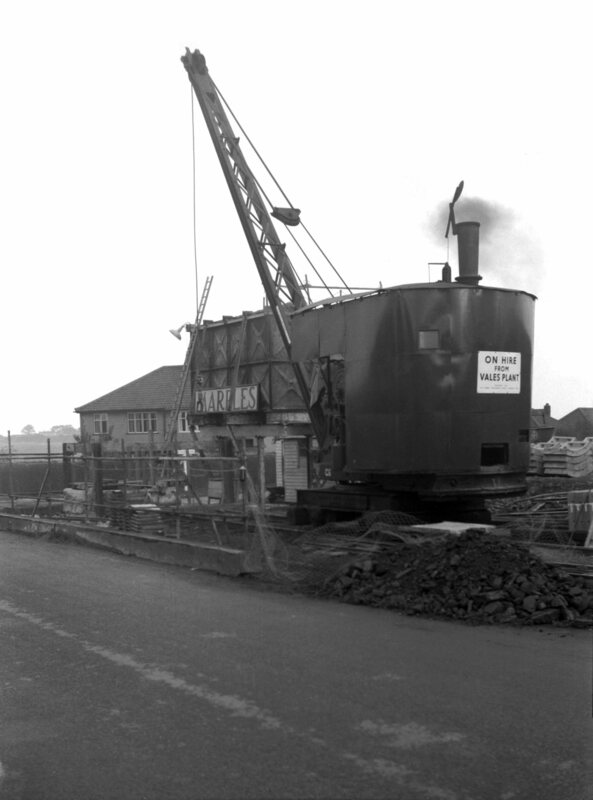 From site of railway line. 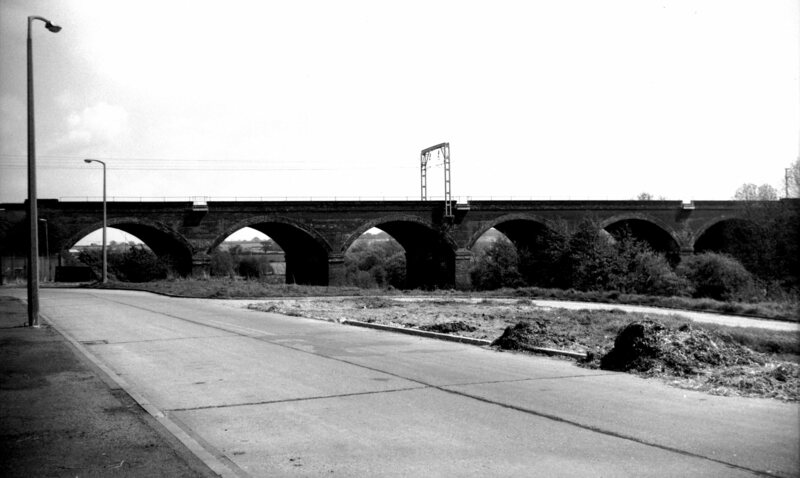 Constructed 1986 on the site of an "A" frame bridge carrying the disused M and GN railway line. 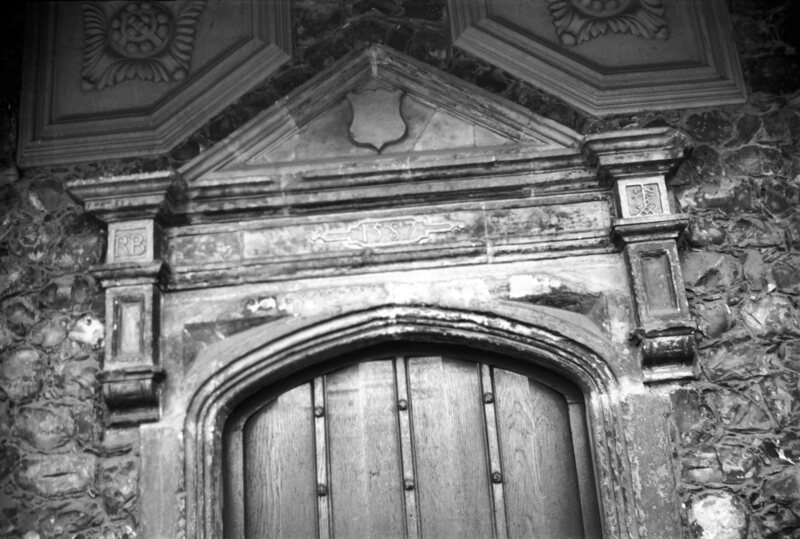 Originally the residence of Richard Browne, merchant, whose initials, arms and mark are above the doorway with date 1587. 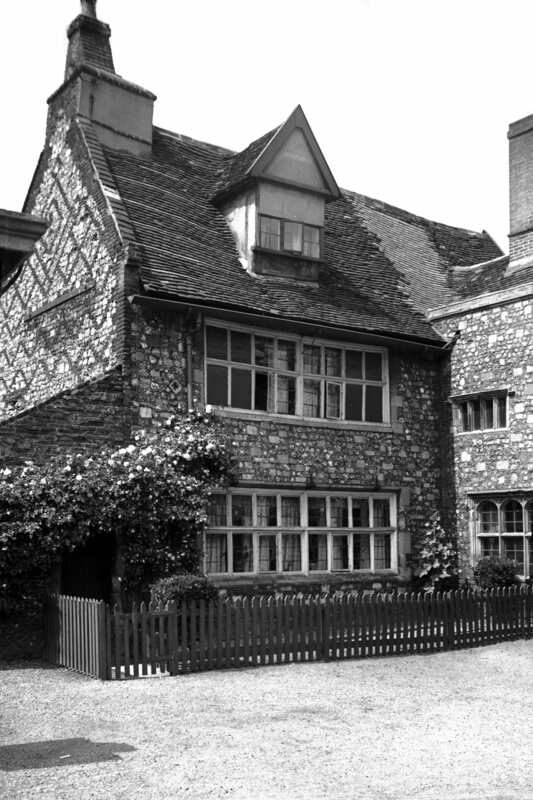 He was Sheriff in 1595 which date appears in brick on the west wing gable. 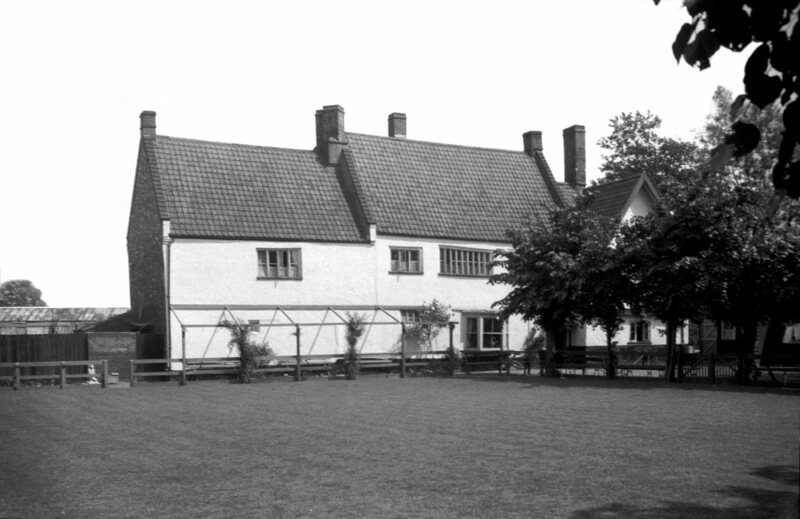 The main (south) front has "A.DN" "1615" abovethe oriels. 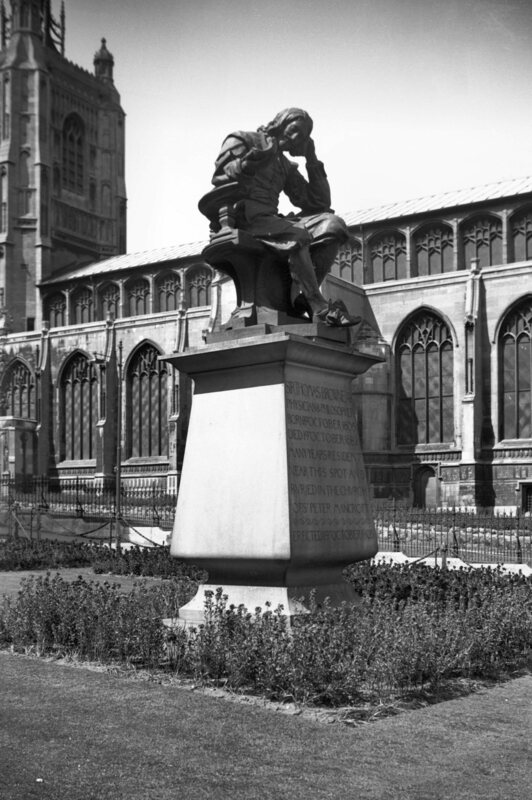 The most famous of its past occupants was Joseph Hall, Bishop of Norwich 1642 to 1656. In 1643 Civil War broke out and he was forcibly ejected from his Palace. 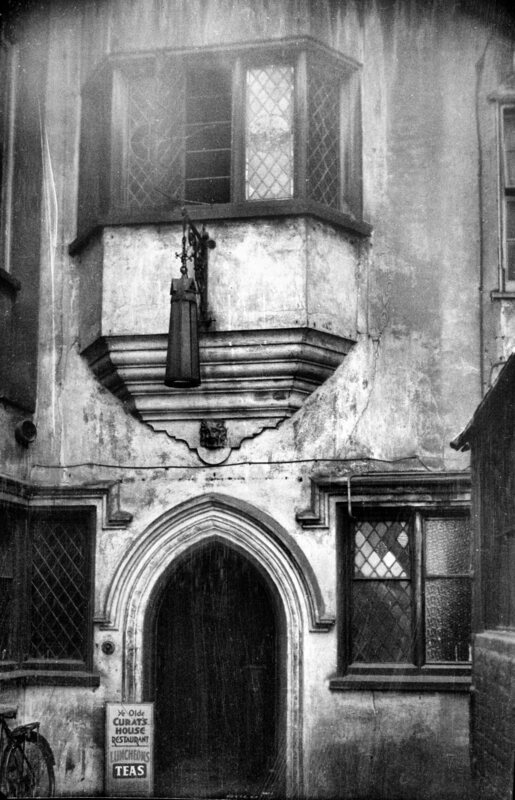 He then took up residence here, and on his death was buried in the neighbouring church of St Bartholomew. 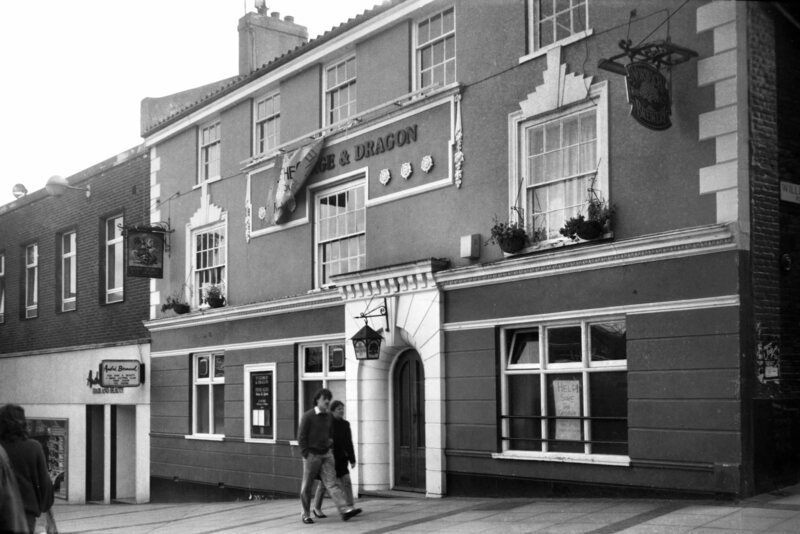 The pub is three buildings in one. 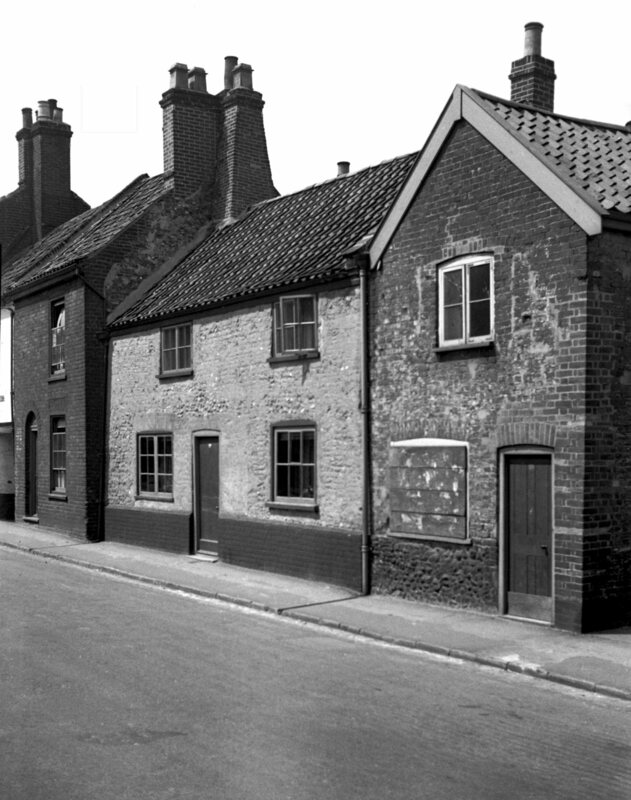 The south end nearest Heigham St dates from 1475. 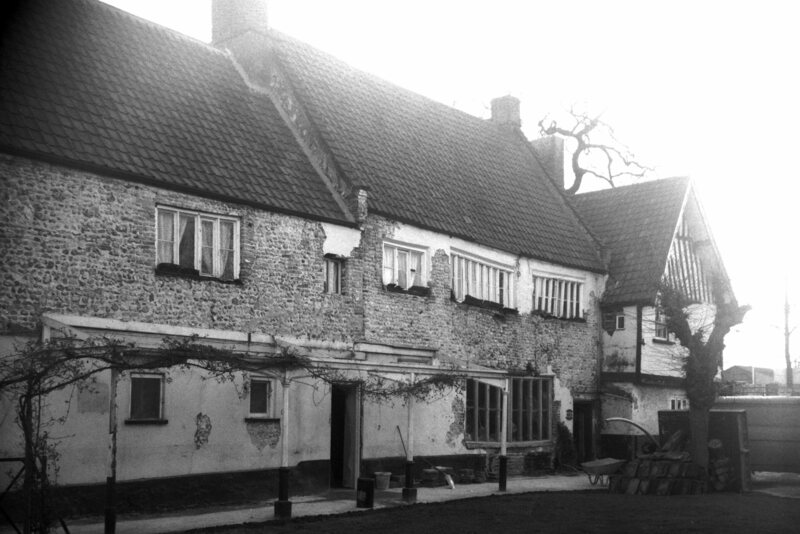 The old cottage end near the river is from 1550, and the middle part which houses the main bar is from 1590. 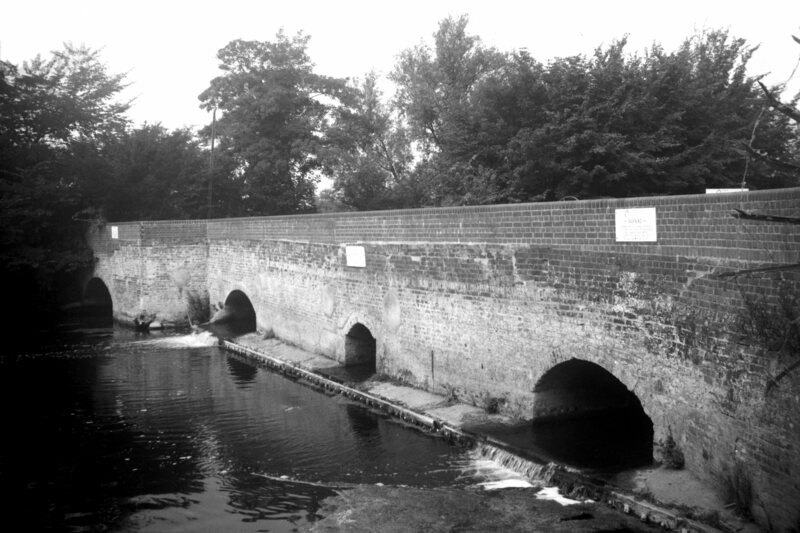 The mill itself has long since gone but the sluice gates remain and are used to control the flow of water between here and the New Mills further downstream. In heavy rain or during periods of thaw after snow, the gates may be closed to prevent the danger of flooding in the city, or, in dry weather, they may be opened more. 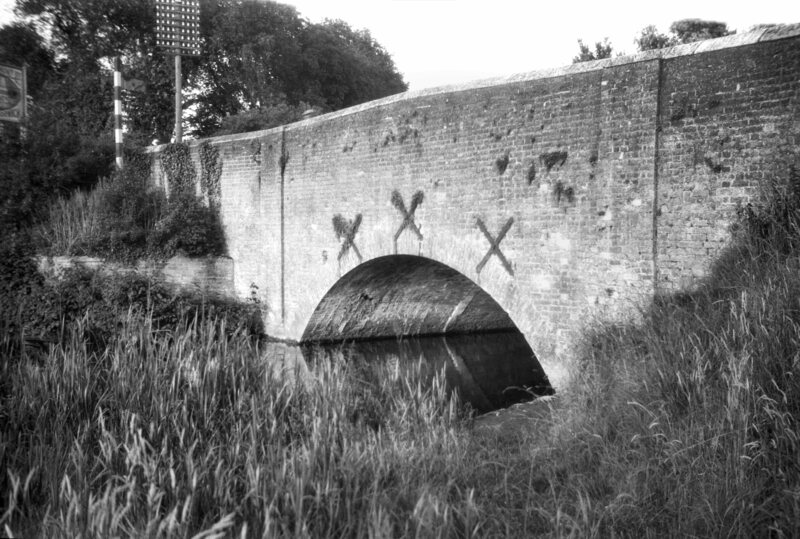 Except that Hellesdon bridge is mentioned in an account of the city boundary in 1556, there is little record of previous structures. 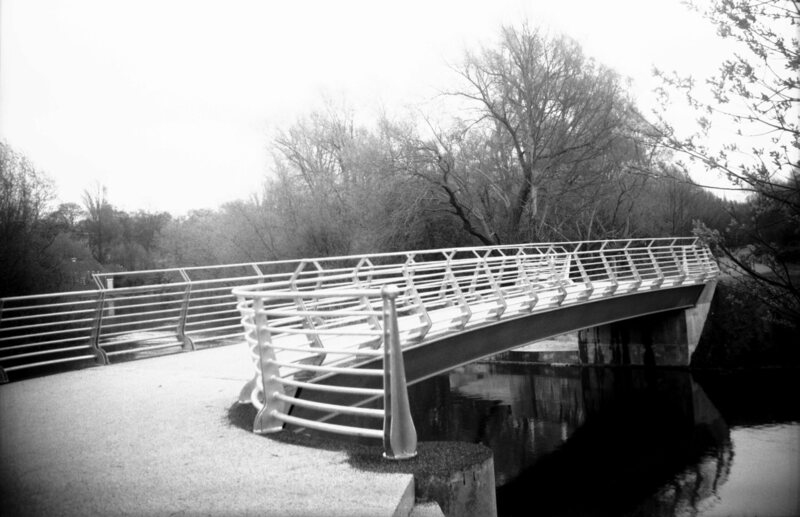 The present bridge is a single 40 feet span of cast iron with a width between the parapets of 12 feet. 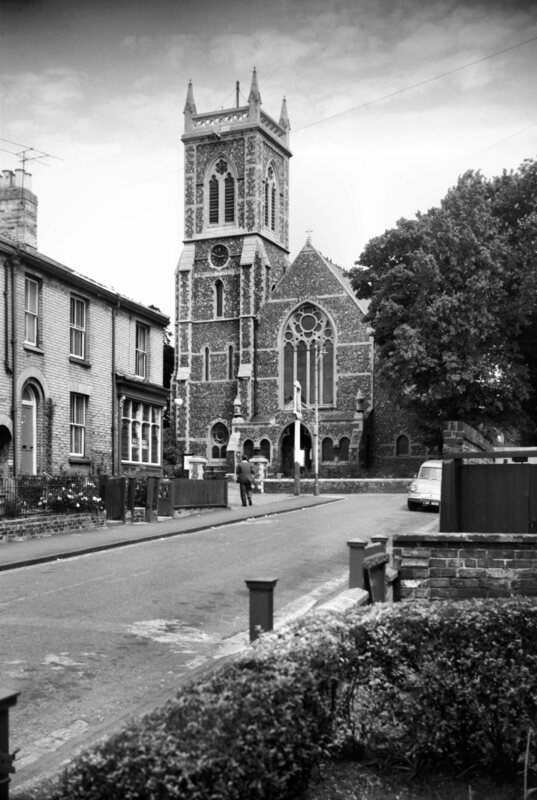 It was erected by the Corporation in 1819 at a cost of £1,169, the builder and architect being James Frost of St Faith's Lane Norwich. 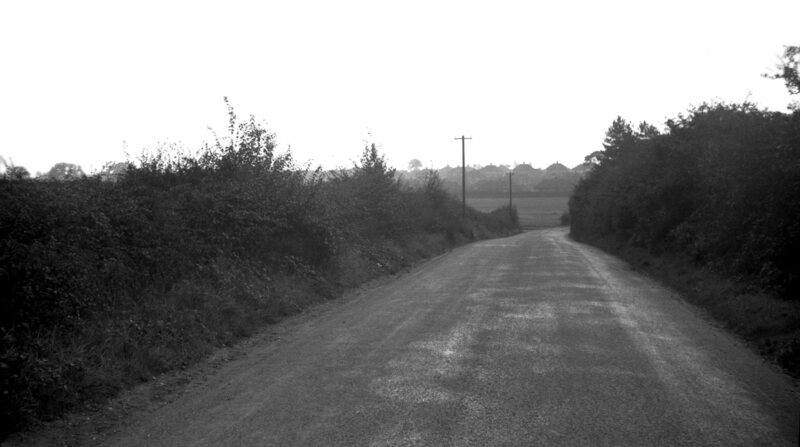 At its southern end the road was built up to a bridge over the adjacent railway line in the early 1880's but has since reverted to its original level following the abandonment of the line. 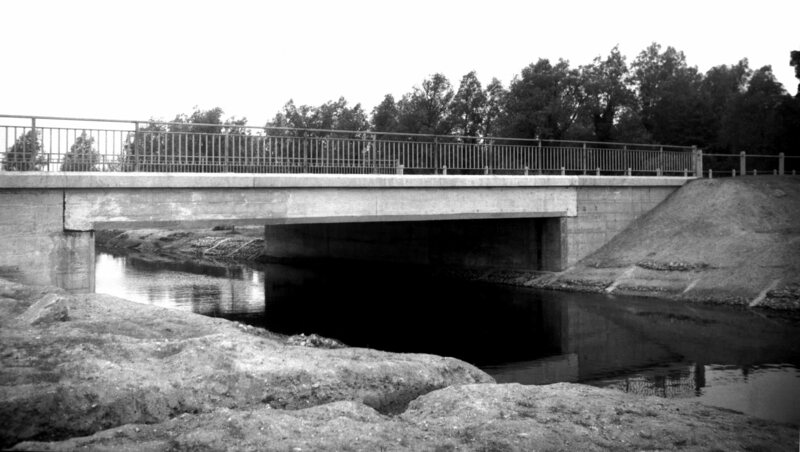 Constructed 2000, replacing the 1986 bridge. 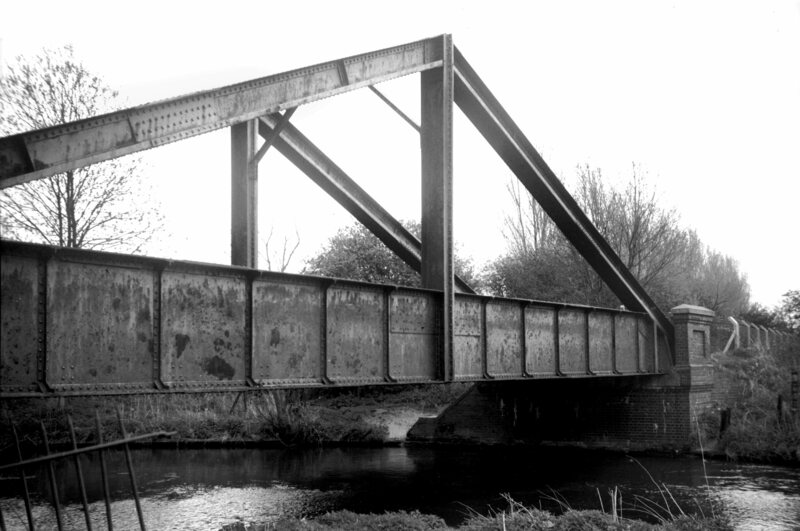 Three "A" frame bridges were built over the river Wensum when the Midland and Great Northern railway constructed a spur line from Melton Constable to their new City Station near Heigham St, Norwich around 1880. 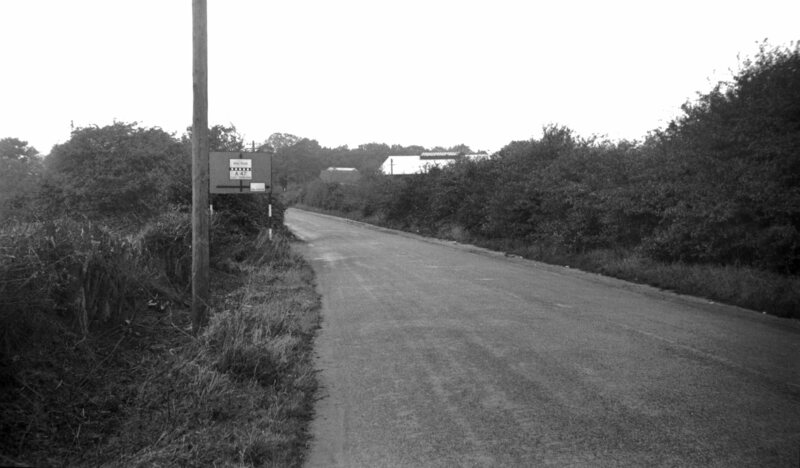 One was around 500 yards east of Hellesdon Station; another was a short distance downstream from the Dolphin footbridge. 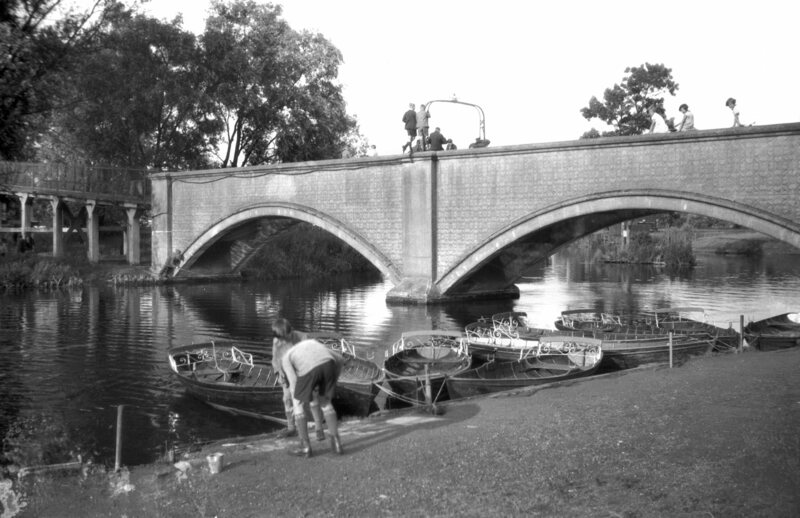 A third bridge of similar construction was built a mile or so further on at Drayton. 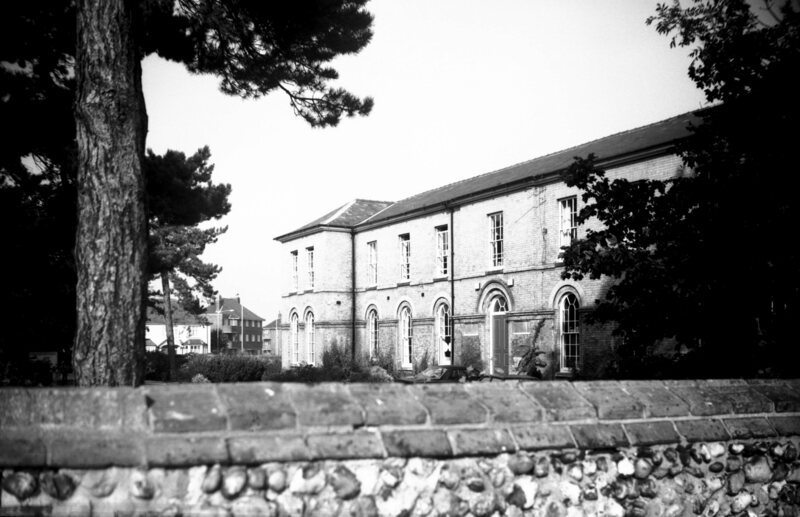 Built 1863 as Anguish's Hospital School of Housecraft for Girls. 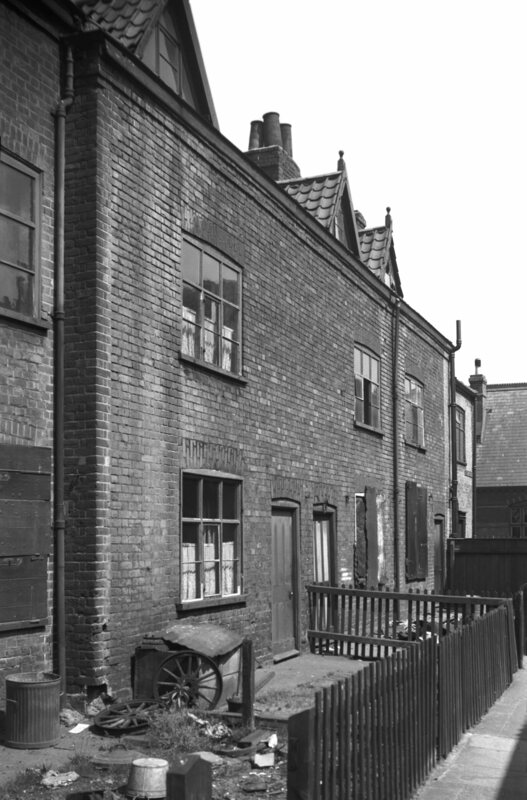 In 1812 this was the residence of Alderman Jonathan Davey. 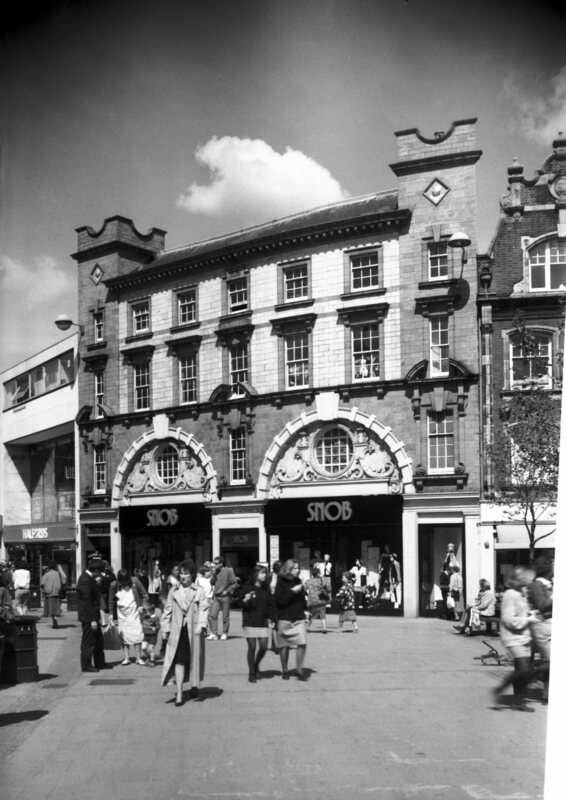 Opened 8th October 1953, architect J.G.Hannaford. 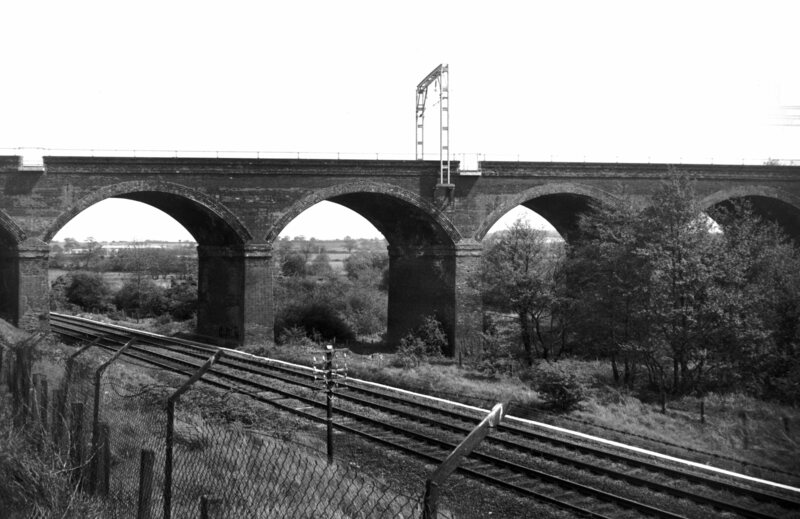 Of six brick arches carrying the London (Liverpool St) line over the river Yare and the line to Ely, it was constructed in 1848-49. 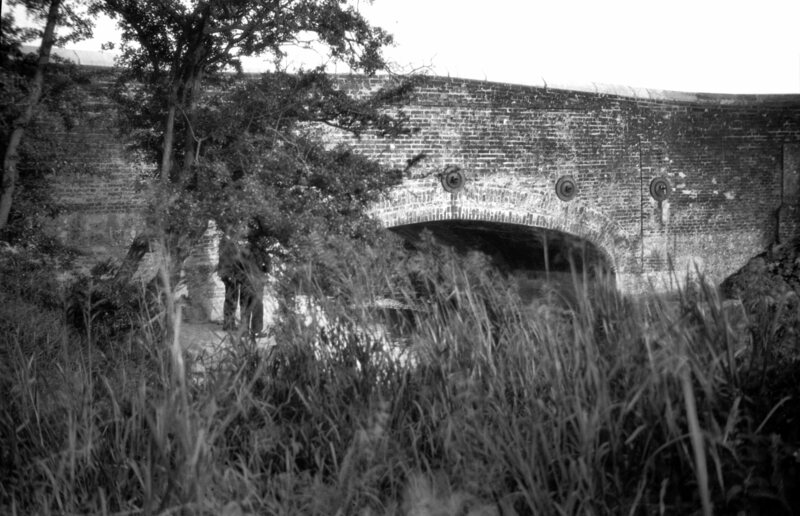 A member of the de Hereford family is said to have first built a bridge here in King John's reign. 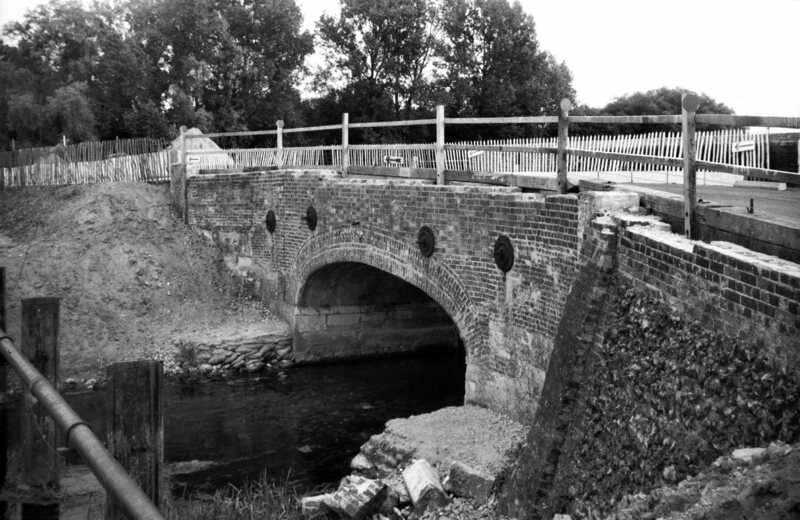 Broken down by a flood in October 1697 it was rebuilt, but in 1767 a temporary bridge here was again washed away. 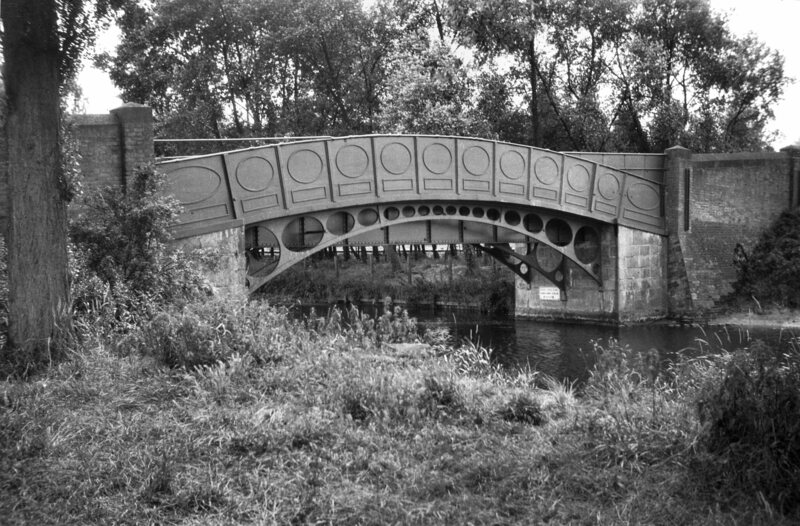 In 1832 this and the adjoining bridge across another arm of the river were built with a roadway of over 20 feet, the former bridge having an elliptical brick arch on stone abutments and the latter having a four-centred arch. 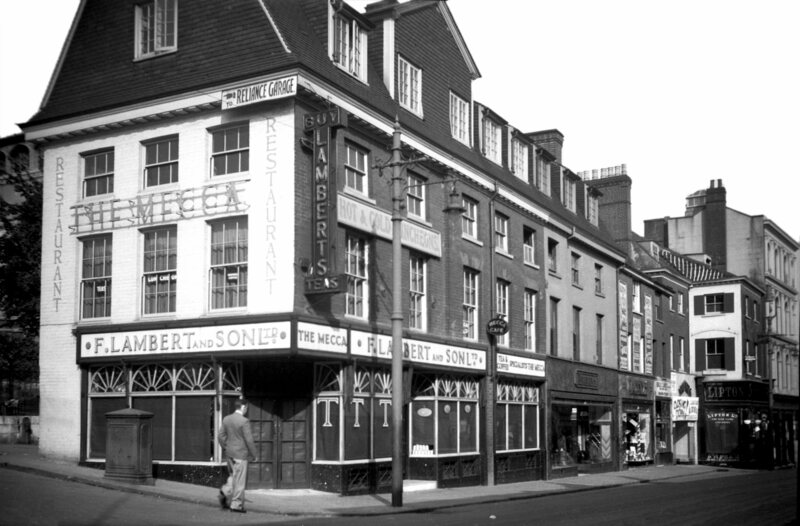 Both ridges becoming weak through heavy traffic (they carried the trunk road from Norwich to Ipswich) they were demolished in 1965 and replaced by a wider, single span supported by beams of reinforced concrete. 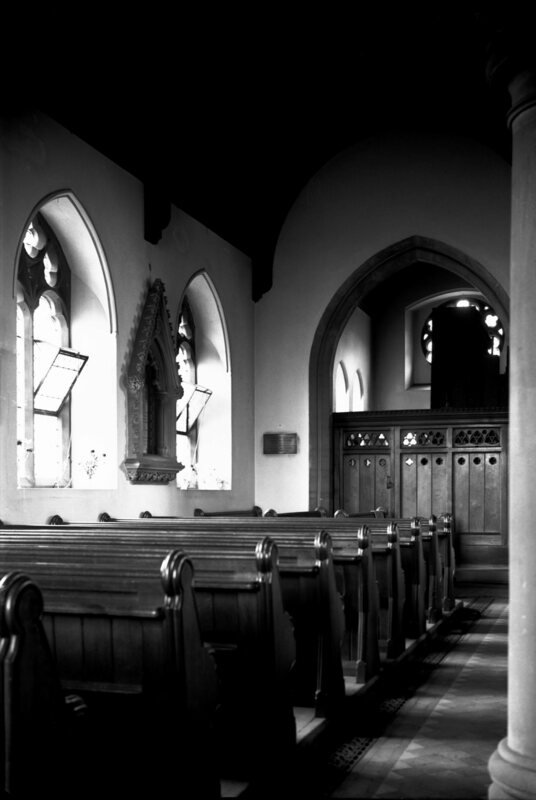 Formerly Congregational. 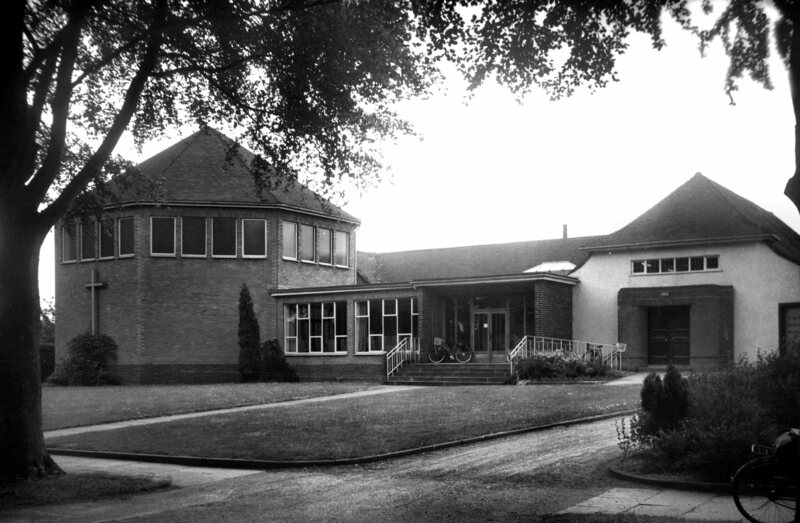 Original building opened 1931. 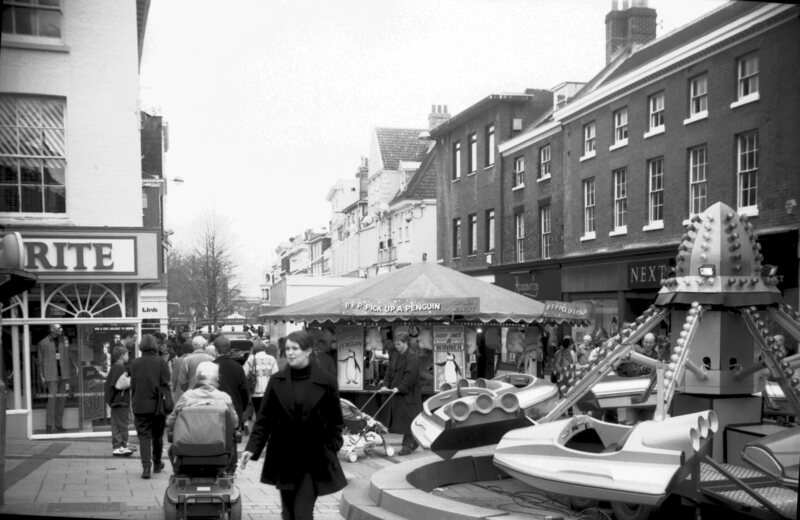 Enlarged 1969. 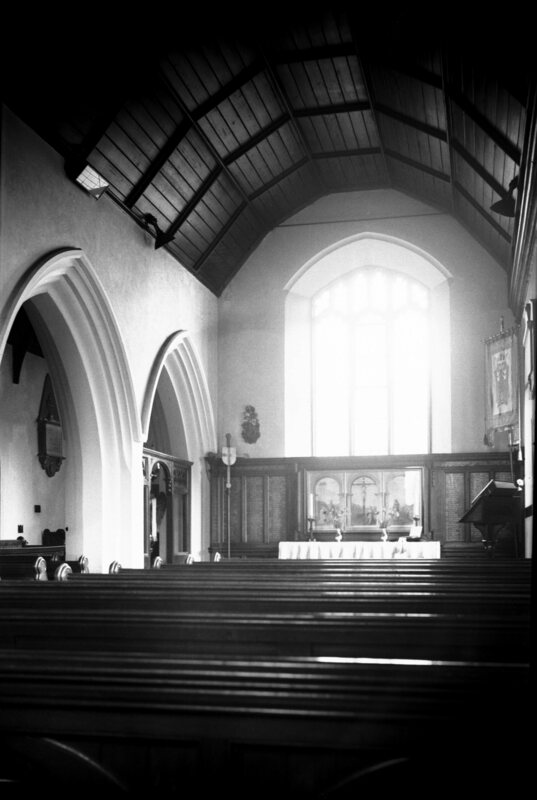 Built 1907 as a Chapel of Ease to St Matthew. 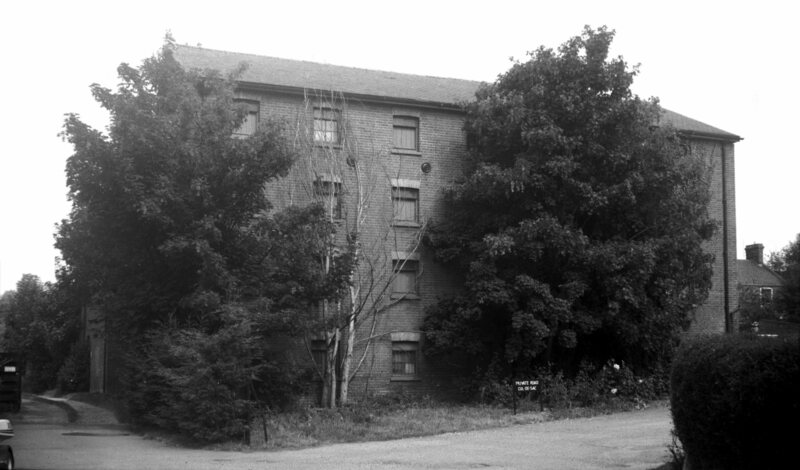 Demolished 1981.